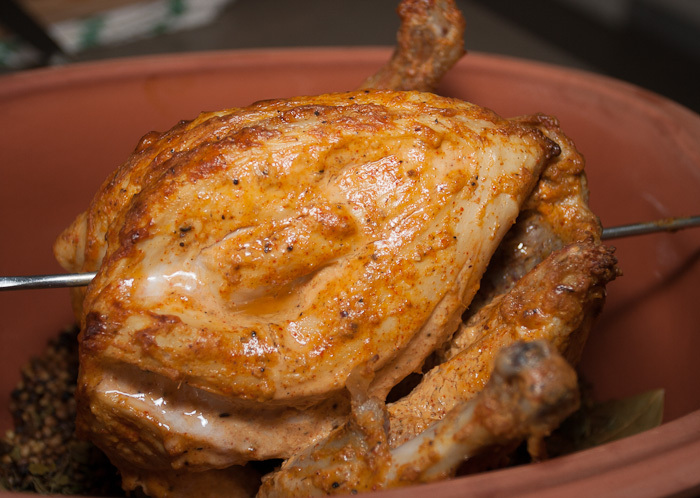 Tandoori chicken cooked at home! 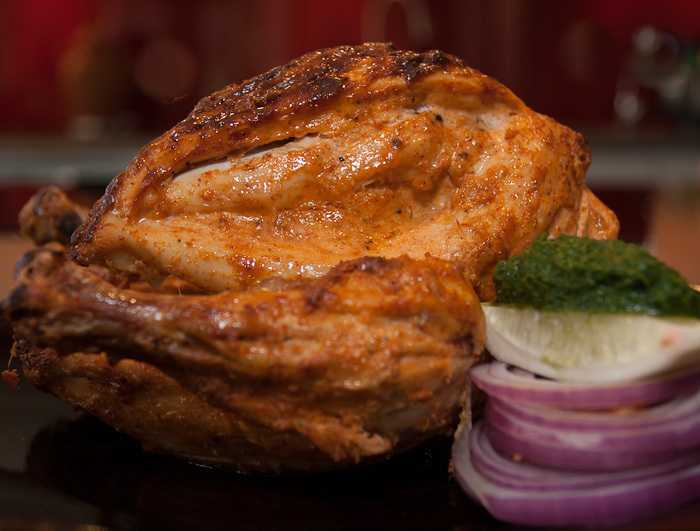 the king of kebabs – tandoori chicken!! 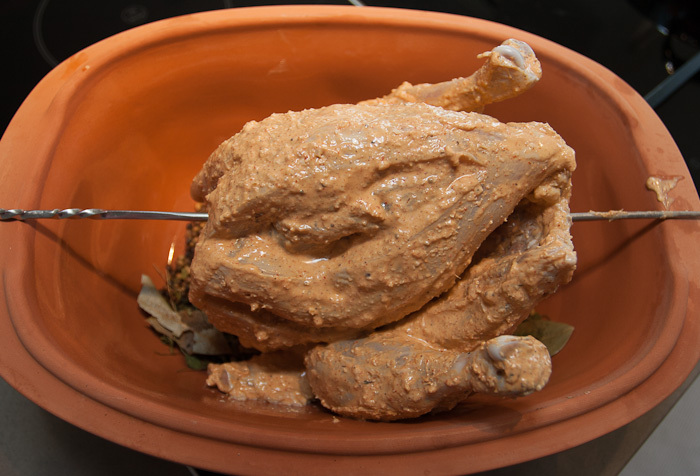 Here is my version of the ‘king of kebabs’, AKA tandoori chicken, which you can make at home even if you do not have a tandoor. Last year I wrote about my memory of this wonderful dish which reminds me so much of my father. If you’re keen for the story, click here. 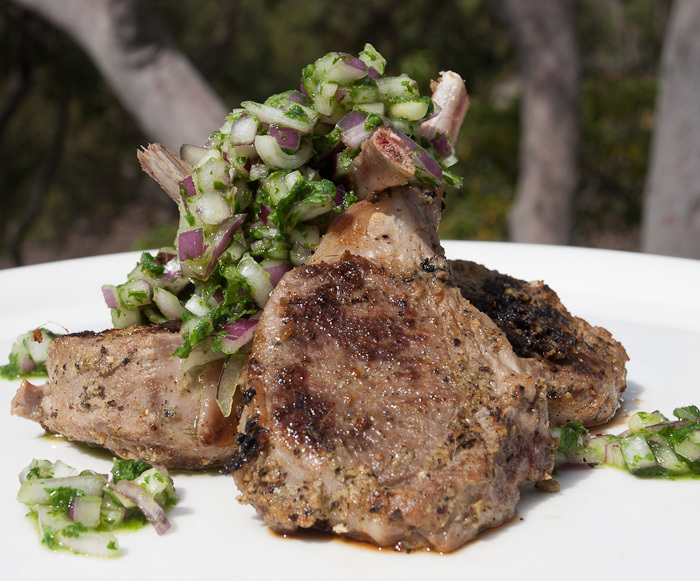 If you’re simply keen for the recipe, scroll down! 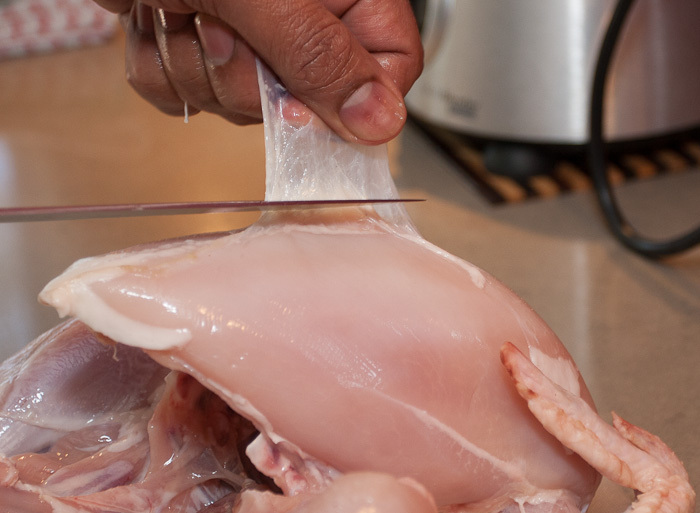 Skin the chicken & remove any excess fat & sinew. Also, remove the parson’s nose. 2. Remove the ends of the winglets on each side. 3. 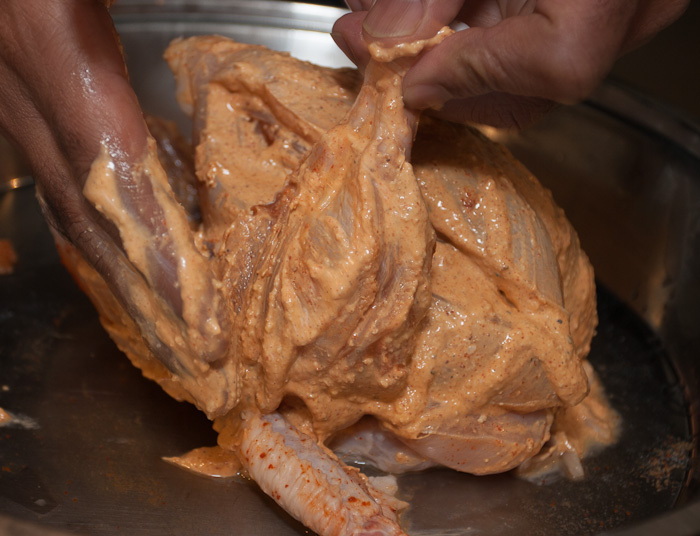 Trim the ends of the drumsticks. 4. 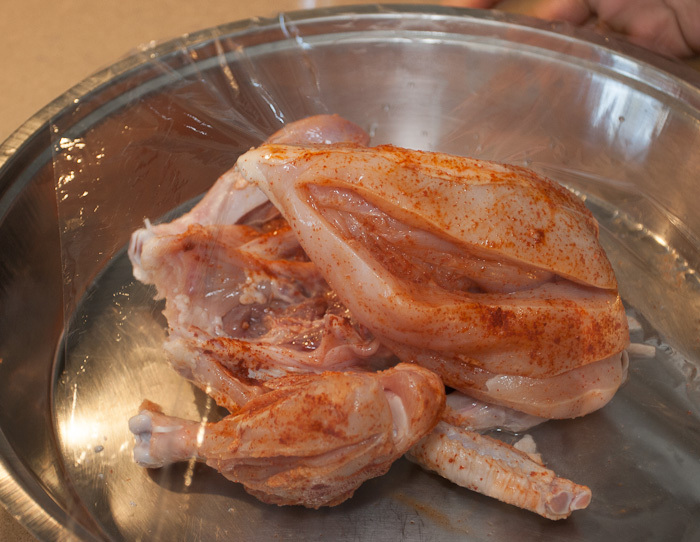 Make a tiny slit between the thigh & the drumstick on each side, without cutting it fully. 5. Make three evenly spaced slits on each drumstick, lengthways. 6. Make three slits on each thigh, as well. 7. Make two slits along each breast, lengthways. 8. 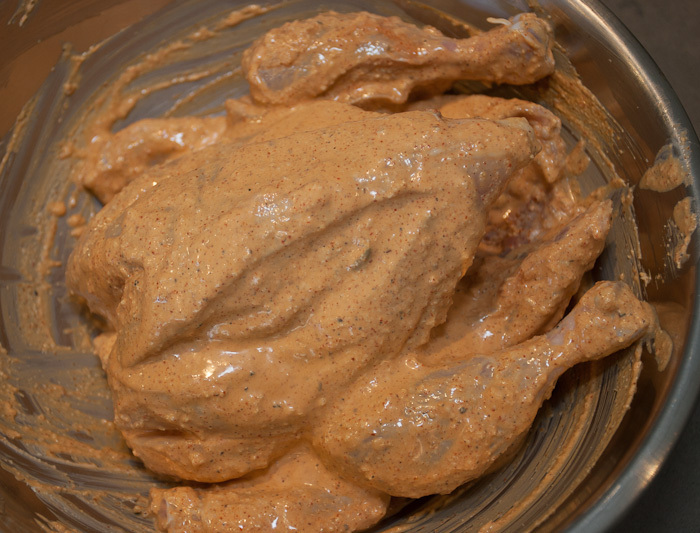 The chicken is now ready for the first marinade. 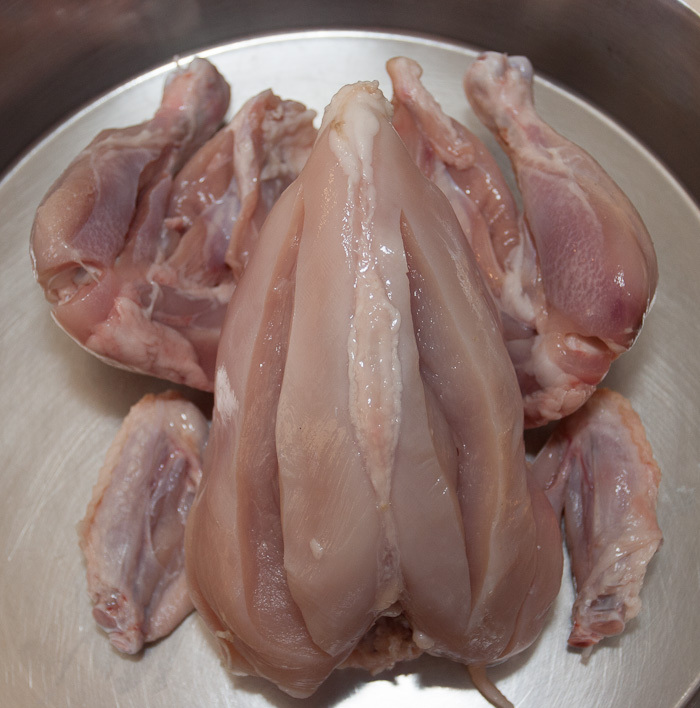 the prepared chicken should look like this!! 1. 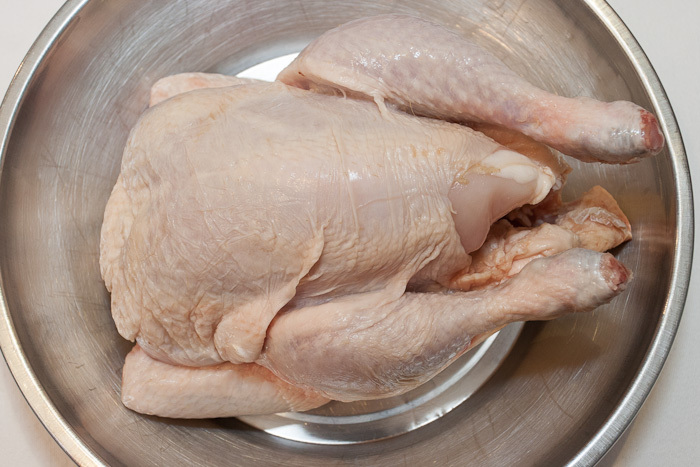 Skin the chicken, remove any excess fat but leave some as it helps keep the bird moist. 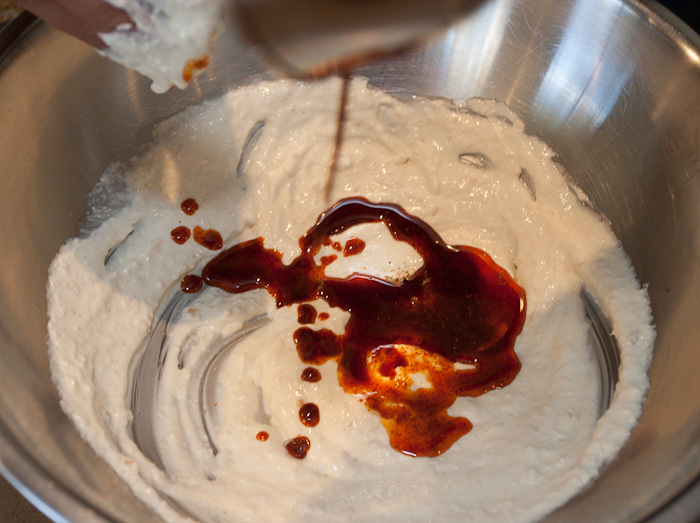 Prepare the chicken for the first marinade. 2. 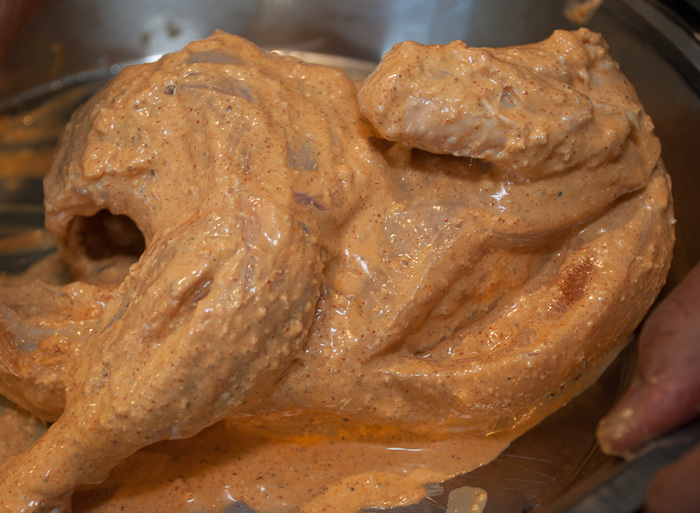 Prepare the chicken for the second marinade/tandoori masala by applying the white vinegar, salt and the chilli. 3. Refrigerate for about 30 minutes. 4. 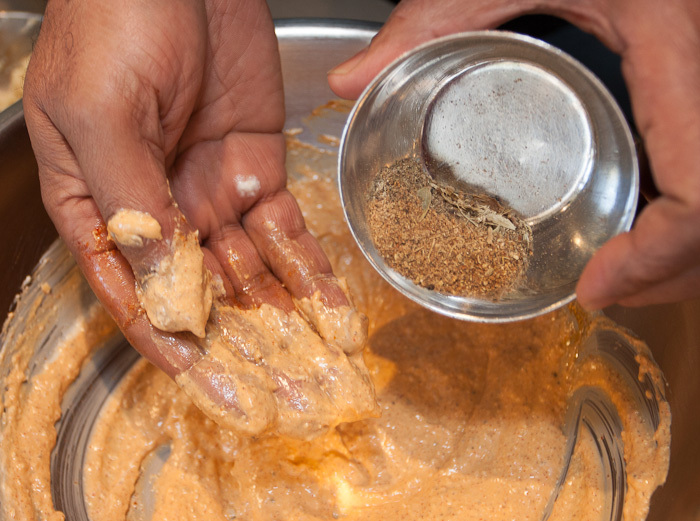 Prepare the second marinade by blending the yoghurt with the crushed ginger, crushed garlic, ground chillies with oil, garam masala, salt together to form a ‘tandoori masala’. 5. 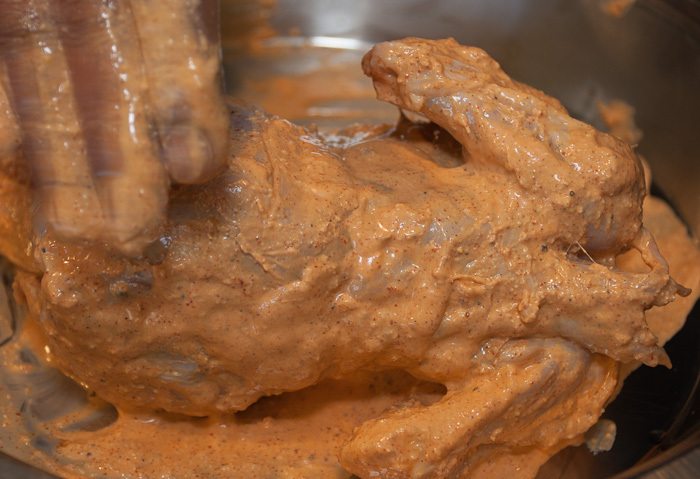 Remove the chicken from the fridge and apply the Tandoori Masala onto the marinated chicken. 6. Cover and place the marinated chicken in the fridge for about an hour. marinated chicken, ready to go!! 7. 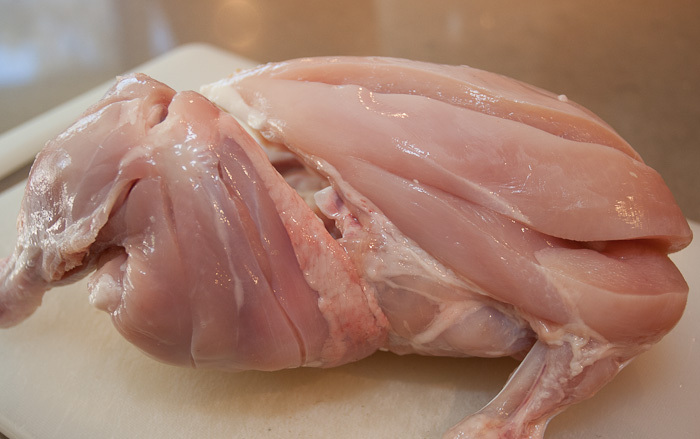 Remove the chicken from the fridge, place a skewer through the chicken. 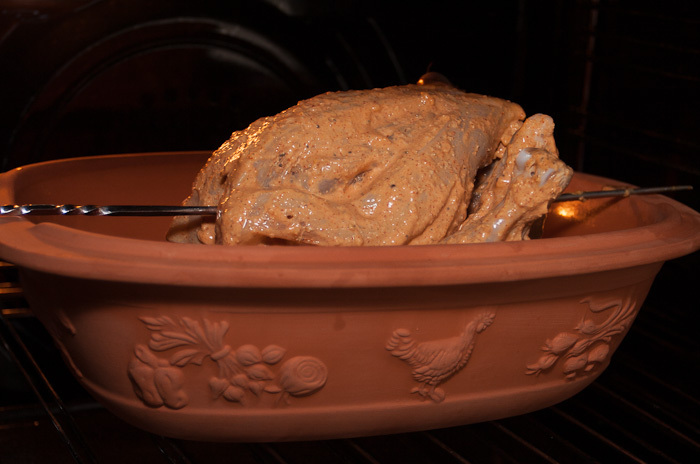 place the chicken in an earthenware, or clay, pot and place this in a pre-heated oven, temp. 160C. 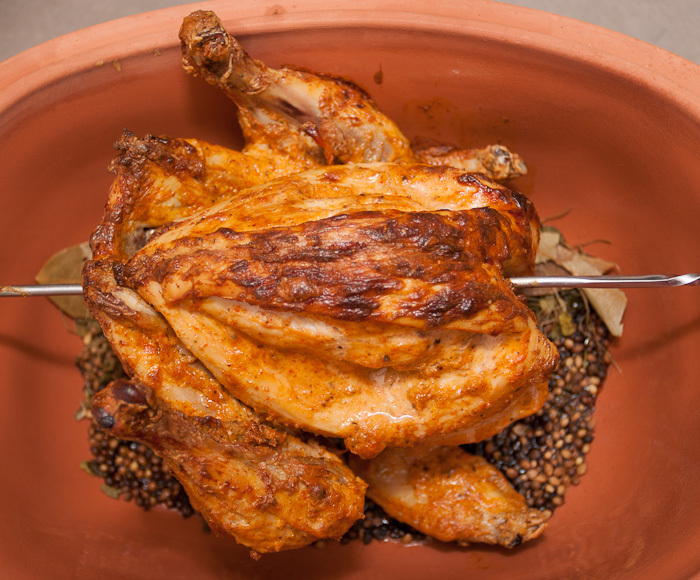 run a skewer through the chicken & place on an earthenware pot or roasting tray with your choice of spices to give a ‘smoked’ flavour! 9. Cook in the oven for about 45 mins, or till the meat is cooked. 10. To caramelise the chicken, turn on the grill in the oven. Cook for about 5 mins, or till the meat is golden. 11. 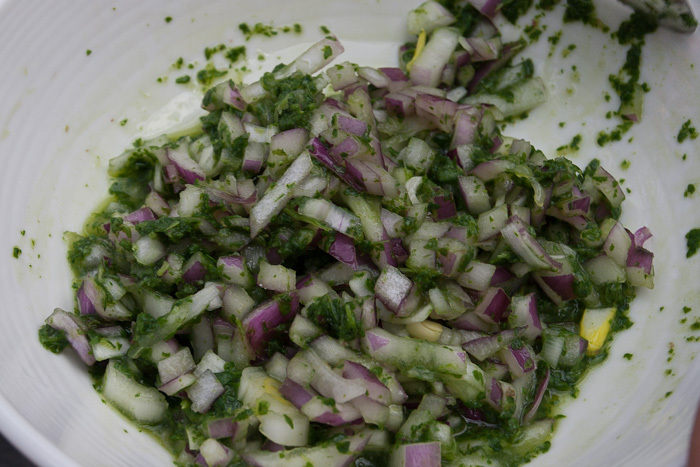 Serve the ‘king of kebabs’ with a mint and coriander chatni, sliced onions and a lemon wedge. 1. 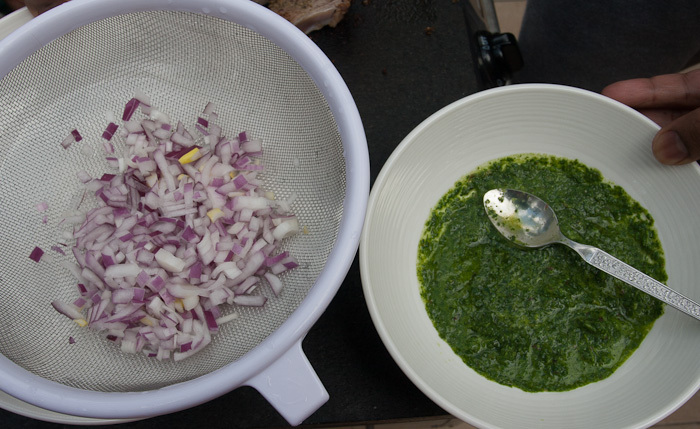 Grind all the ingredients, except for the red onion and lemon wedge, to a fine paste. 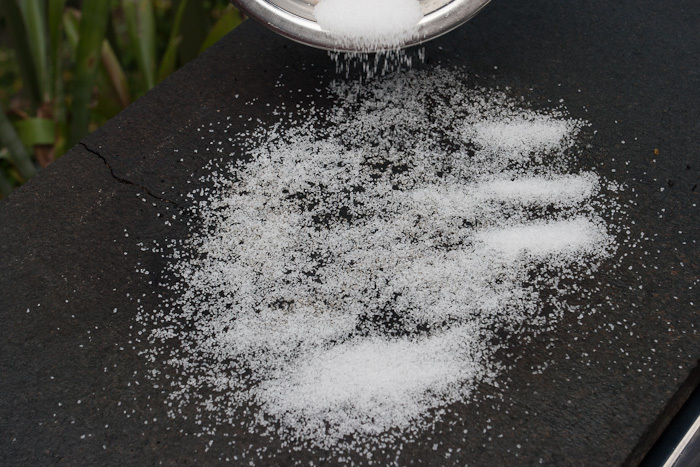 Add salt, as required. 2. Refrigerate and serve with the hot chicken alongside the sliced red onion and lemon wedge. 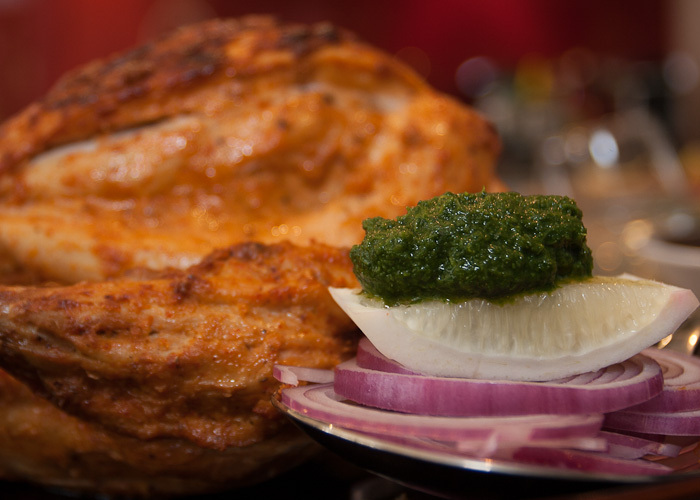 the perfect accompaniment to the “king of kebabs”!! 1. 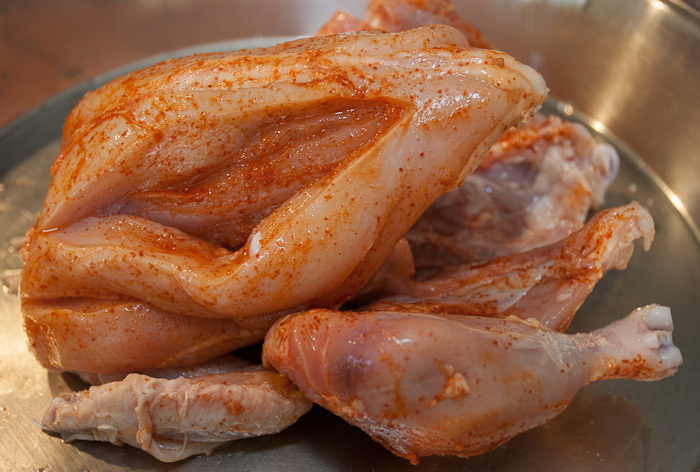 Buy the chicken with the skin on as this keeps the meat moist, even if you are not marinating it the same day. 2. 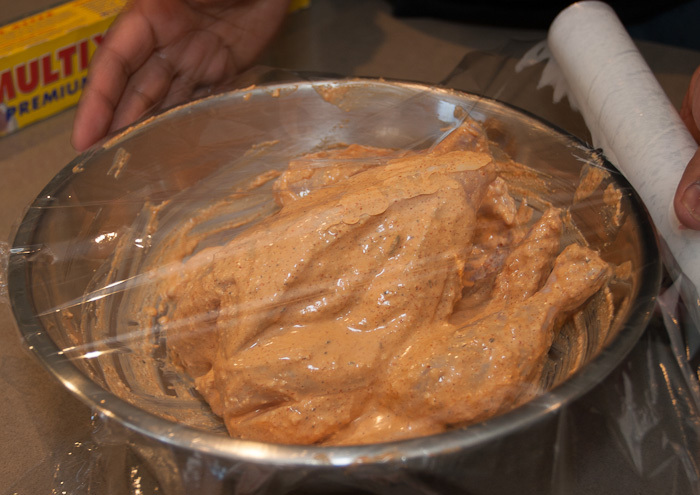 Remember to prepare the chicken for the second marinade by applying the first marinade. 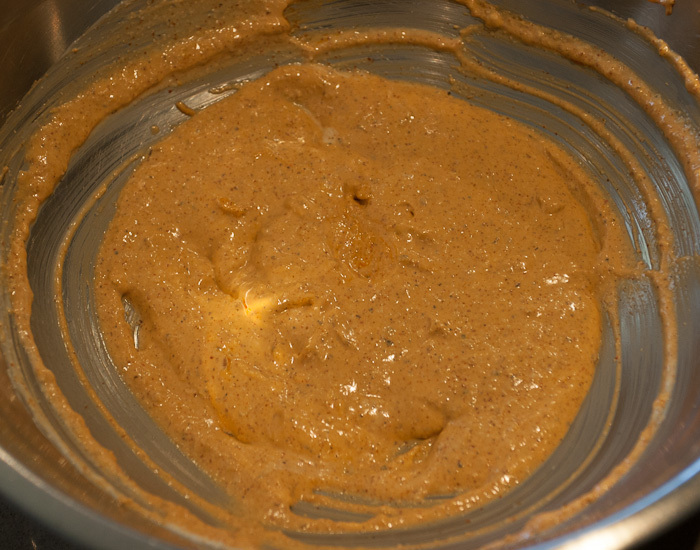 Do not add the first marinade to the second and apply it on to the bird altogether. 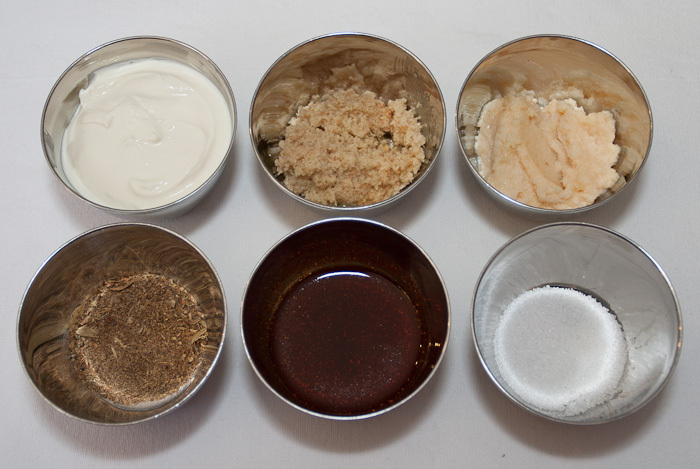 This won’t save you time, also, the marinade will not stick to the chicken. 3. 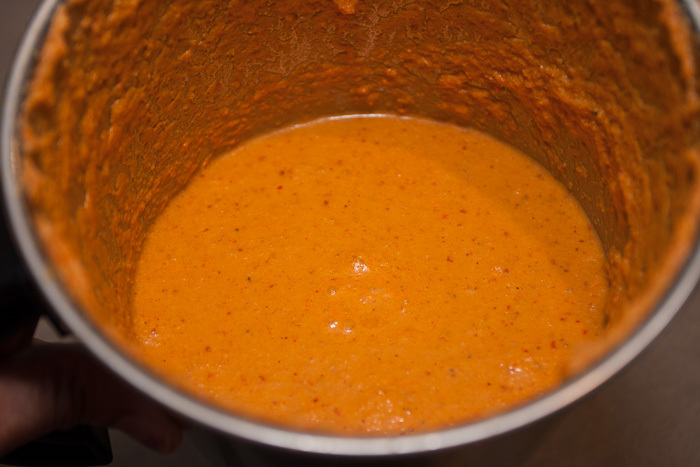 To get the red colour, soak the chillies in lukewarm water till they swell (balloon), then squeeze the chillies and crush in a food processor with some vegetable oil. 4. 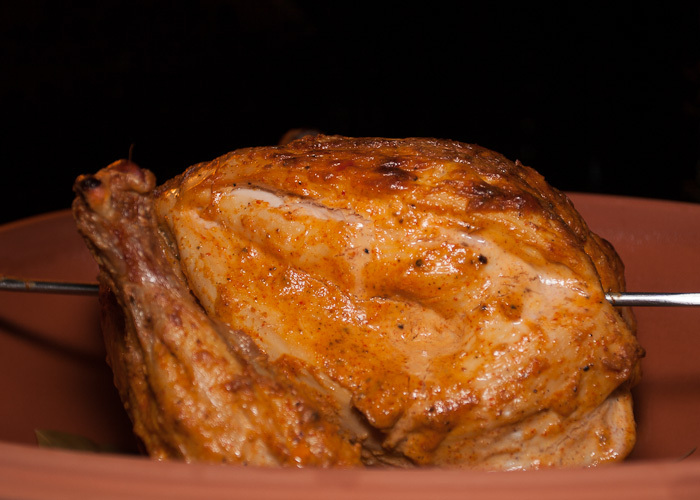 Cook the chicken at a temperature of 160- 170 C as this keeps the meat moist and allows the chicken to cook from the ‘inside – out’. 5. 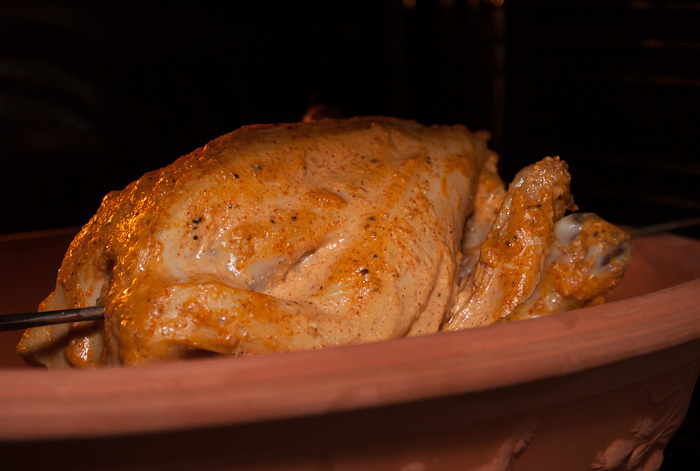 To caramelise the chicken, flash under a hot grill or do as I do here! 6. 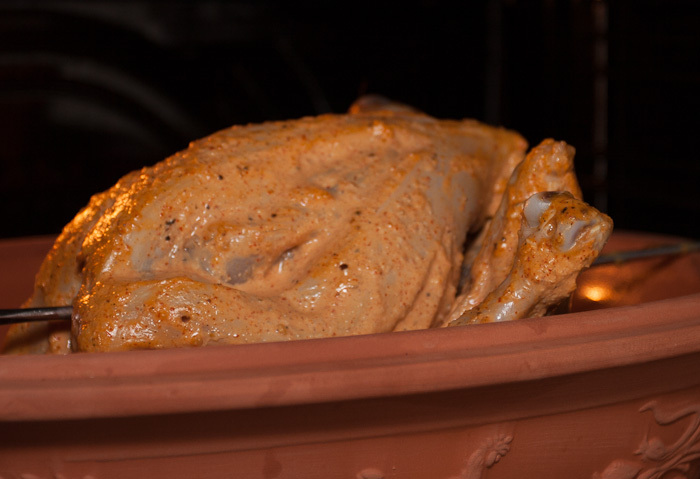 Add your choice of whole spices to the earthenware pot before placing the chicken in it. 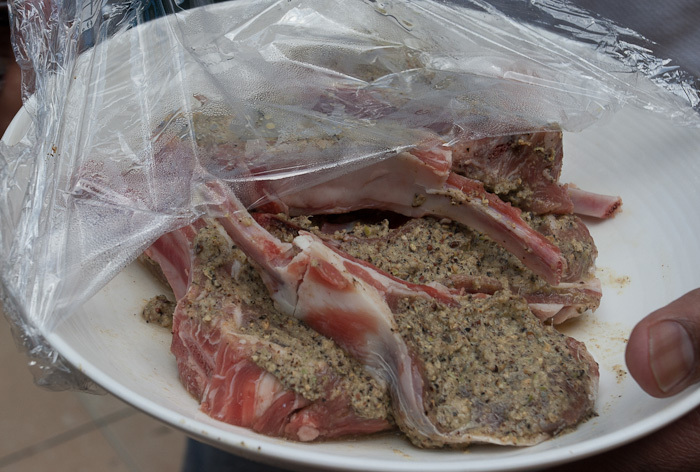 As the oven heats up, so do the spices and the smoked flavour permeates into the meat. Posted in Basics, chicken, Classic meals, Uncategorized and tagged chicken, coriander, garlic, ginger, Kashmiri chillies, kebab Garam Masala, lemon, mint, pomegranate extract, red onion, salt, spanish onion, white vinegar, yoghurt. Bookmark the permalink. This is soul food for the Goan!! In my quest to understand the different cuisines on the west coast of India, and the subtle differences between them, I was asked to go to Mumbai to meet one Mr Almeida. Chef Almeida was a Goan by birth and though he was trained at the Culinary Institute of America, he was considered an authority on Goan food. He was on a short visit to India from New York, where he was then based. 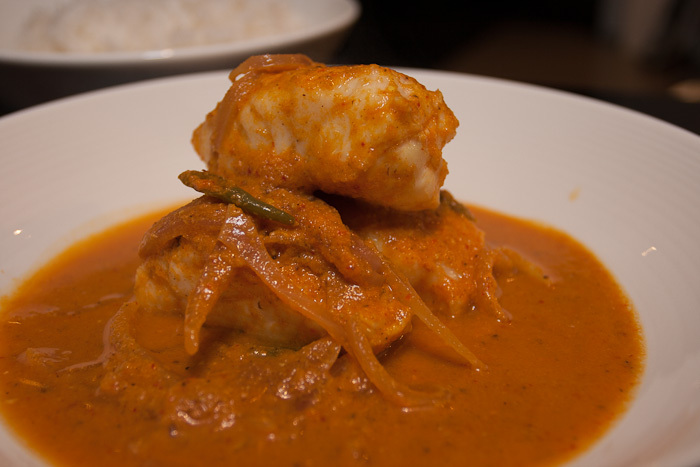 My job was to understand the ‘cuisine of Goa’. No mean feat! We met at the Shamiana restaurant at the Bombay Taj and my crash-course on Goan food began. . . Chef Almeida went on to tell me how there were at least two distinct styles of cooking in Goa. One belonged to the Hindus (both Brahmins and non-Brahmins) and the other to the Christians (again, Brahmins and non-Brahmins). You see, the Christians were converts of both these castes. Then there were the Muslims which must add a third – but I waited to hear what he had to say. 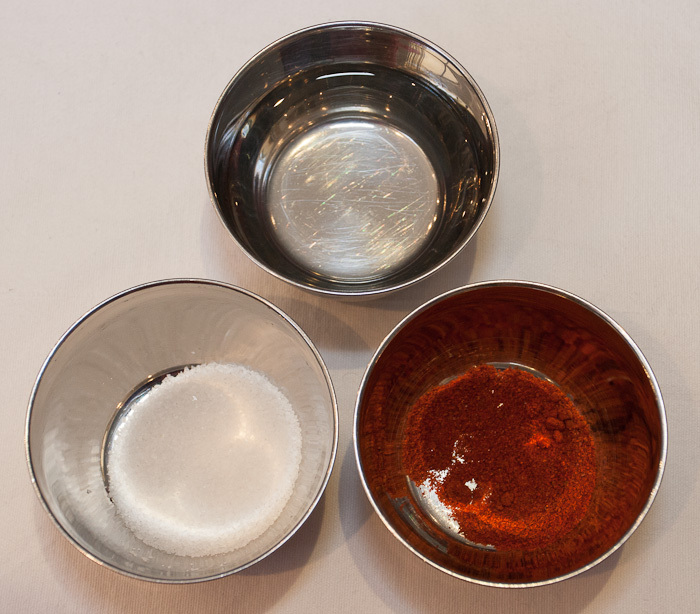 The Christians used vinegar in their cooking whereas the Hindus preferred kokum as a souring agent. 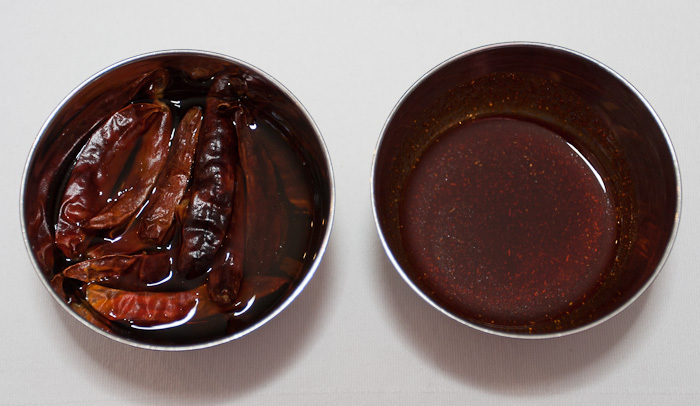 Tamarind was used by both the communities but preferred by the Muslims. 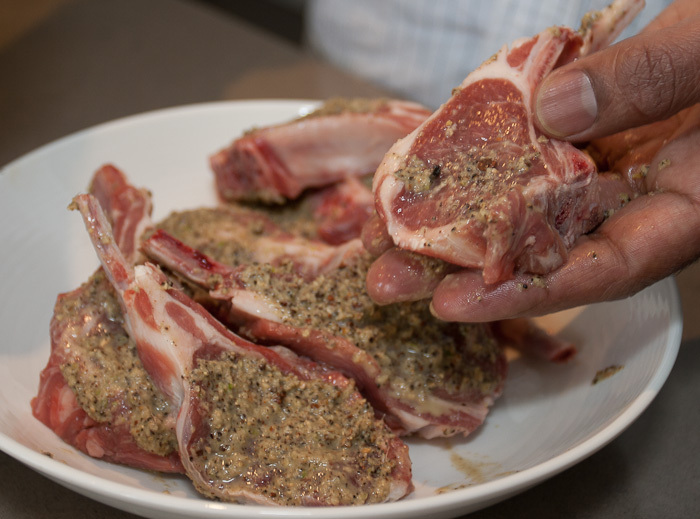 Lamb and chicken were the preferred meat of the Hindus. 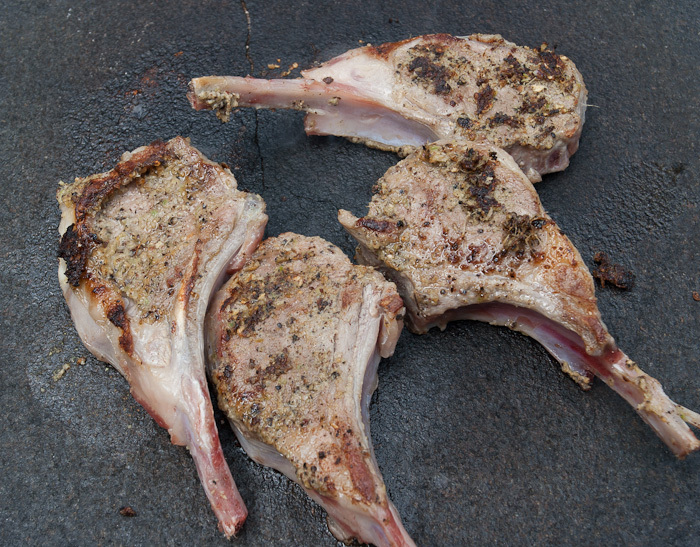 The Muslims liked lamb and the Christians ate everything, including pork !! This dish is soul food of the Goan people and the famous poet from Goa, Bakibab Borkar, describes this favourite dish with great emotion. there is fish curry for dinner. You can’t say it better than that! 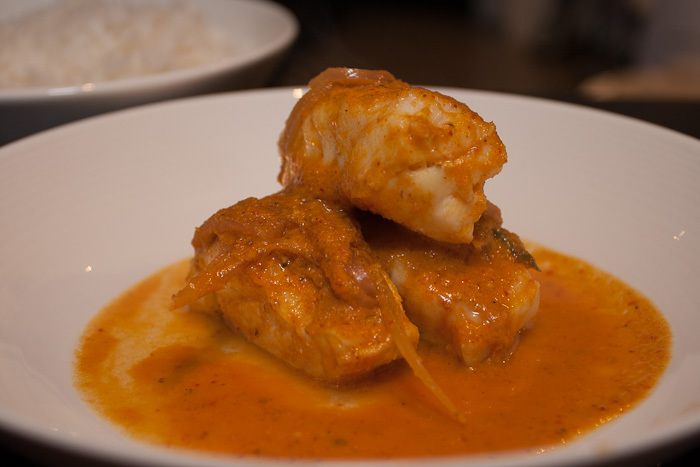 So, without further ado, here it is, folks, a soulful Goan fish dish. 1. 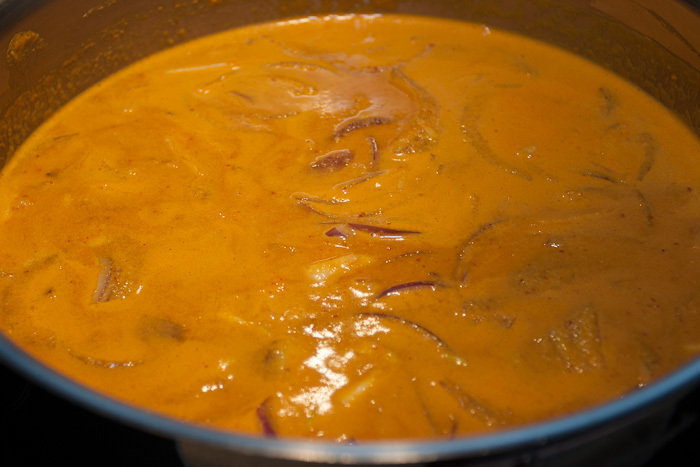 In a pot, add the masala, along with 2 cups of water and the sliced onion. 2. 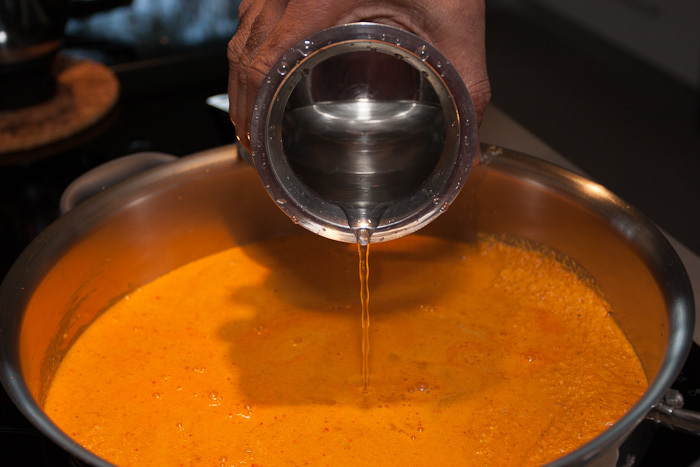 Bring the mixture to a boil, over moderate heat. 3. 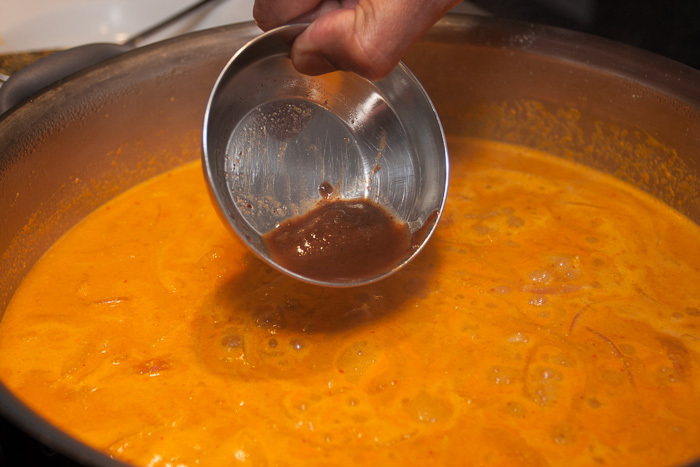 Add the tamarind concentrate and reduce the heat. Cook for about 2 minutes. 4. 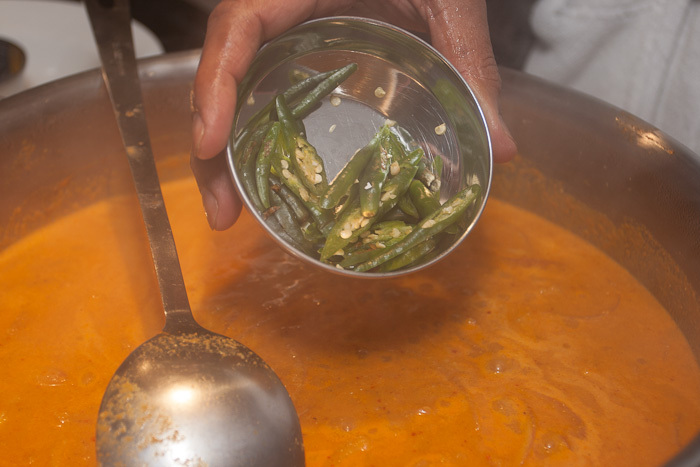 Add the salt and the chillies. 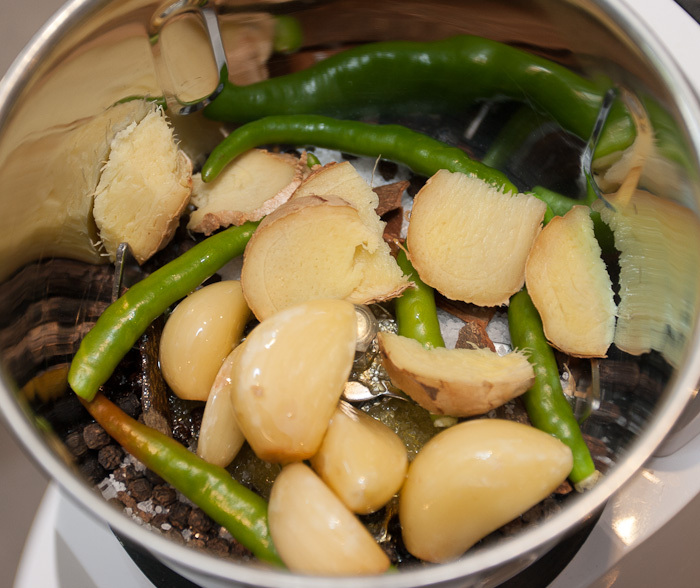 Cook for a few more minutes, until the chillies release their aroma. 5. 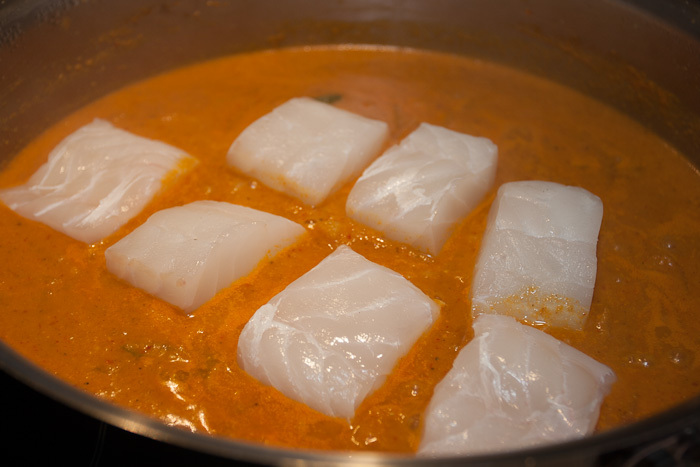 Now add the fish and cook for a further 3-4 minutes, or until the fish is cooked. serve with hot sanna or brown rice or sticky white rice, best eaten of course, the day after!! 1. Soaking the chillies in vinegar helps bring out their bright colour when ground. 2. 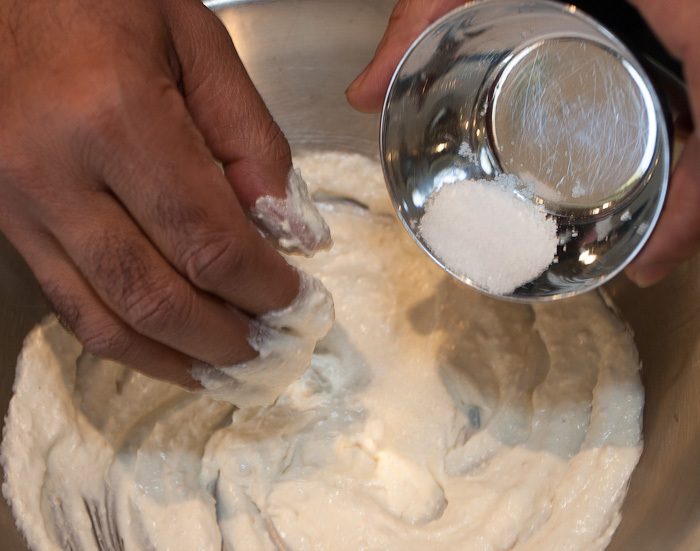 You can use coconut cream instead of fresh coconut. I have found the ‘Kara’ brand of coconut cream to be very consistent and ‘rich’. 3. 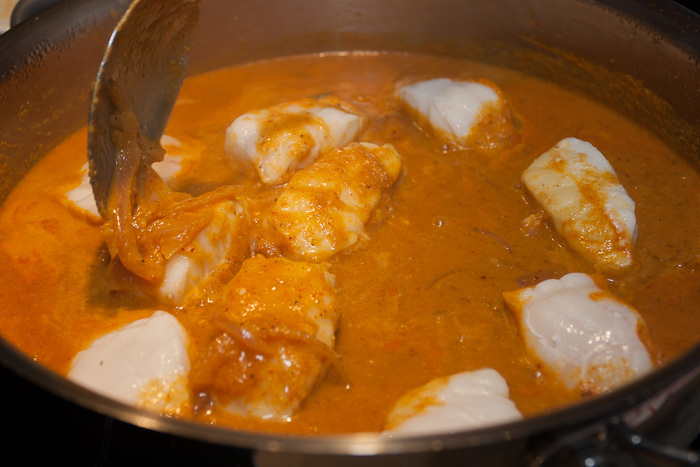 Add the fish to the cooked masala [sauce], and allow the fish to cook over a moderate heat. Do not stir. 4. 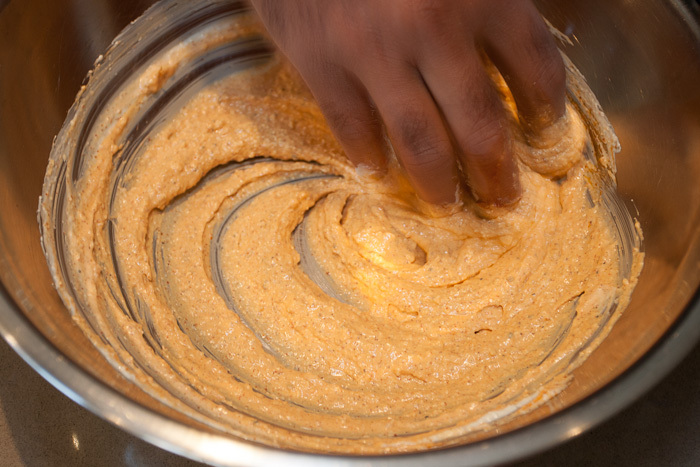 The dish is best eaten the day after it is made. 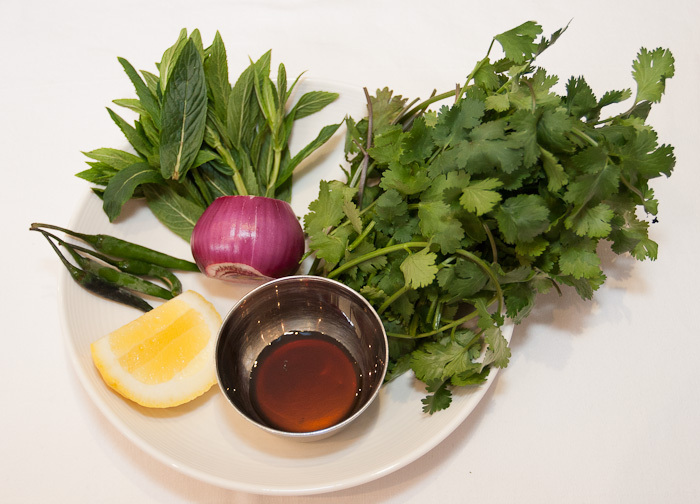 This allows the flavours to mature fully and to permeate through the fish. 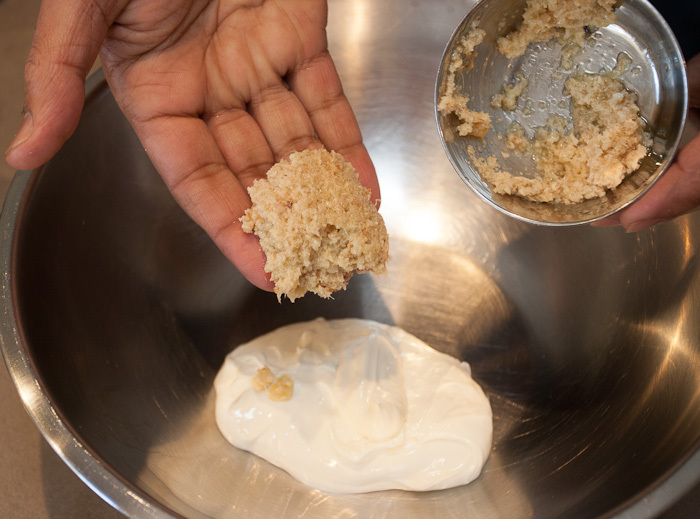 Serve it with a steaming hot sanna, or brown rice, or sticky white rice. 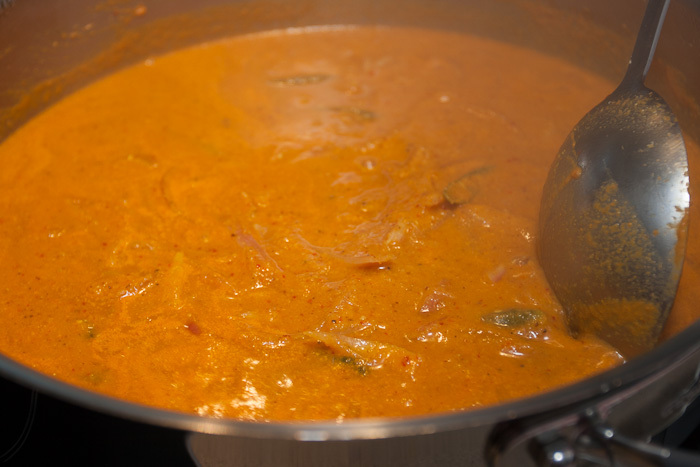 The sign of a ‘good’ Goan fish dish is when your eyes get red and sweat starts pouring all over your face and you say, “Vindaloo, what is that? That’s nothing in comparison to this. This is rocket fuel! !” This is food for the soul and body, Goan style, in extremis! Remember though, never drink water to try to ‘cool’ yourself down. Do what the Goan does. Just have a glass or two of Feni!! 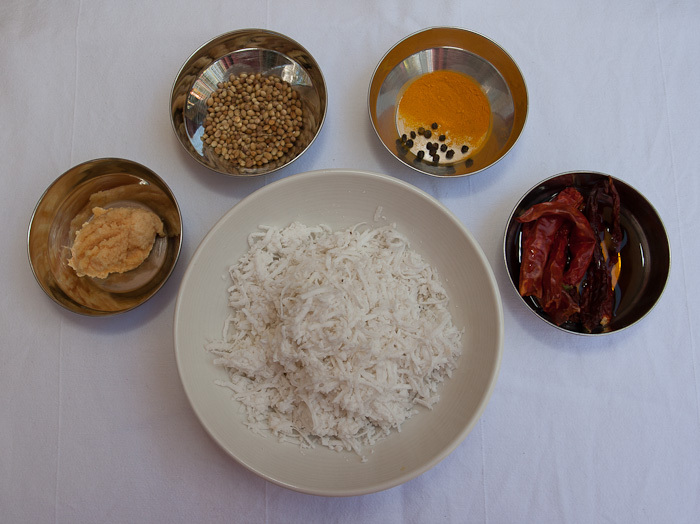 Posted in Classic meals, fish, Rice, Uncategorized and tagged barramundi, black peppercorns, brown rice, brown vinegar, coconut cream, coriander seeds, Feni, fish stew, fresh coconut, garlic, ginger, goan fish dish, green chillies, Kashmiri chillies, ling, masala, red onion, sanna, snapper, spanish onion, sticky rice, tamarind extract, white rice. Bookmark the permalink. In December way back in 1980, I was on a training course at the Banjara Hotel in Hyderabad when my friend Pramod invited me to attend a nikaah in the old city near Charminar. This was a wedding where I knew neither the bride nor the groom but I attended nevertheless as a ‘guest of a guest.’ Pramod invited me knowing I was interested in learning about Hyderabadi Muslim weddings: the ritual, the ceremony and, more importantly, the food that is served on these auspicious occasions. Hyderabadi Muslim weddings are very unique, or at least they were back then. For one thing, at that wedding the bride and the groom wore no gold ornaments. Instead, it was all silver and pearls. Yes, silver and pearls took precedence over gold. Even the bride’s wedding dress was totally white without even a hint of any ‘gold’ thread or shimmer. It was an entirely white wedding! Once the ceremony was over, it was dinner time and I was really looking forward to this. The daawat was amazing. There was lukmi, shikampoor . . . zamin ki machchi, murgh ka shahi qorma. The KGKB [Kache Gosht Ki Biryani] was sublime and then there was this khansama making something I had never seen anywhere else in India. 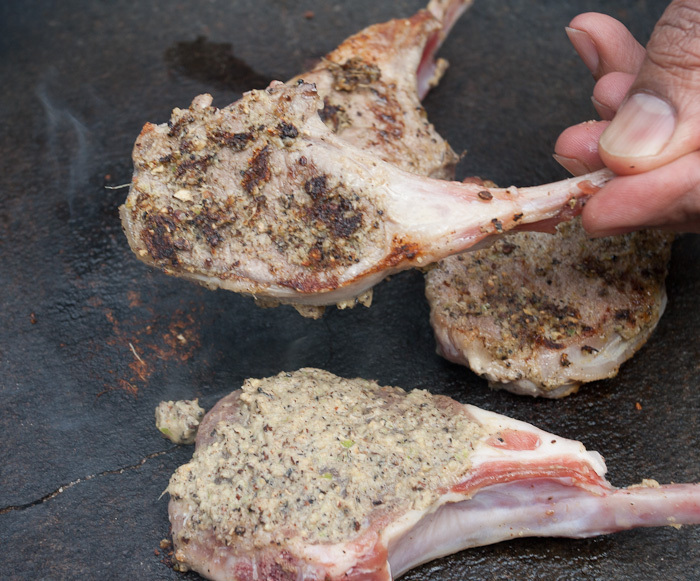 The khansama had the most amazing way of cooking thin slices of marinated meat on a stone. 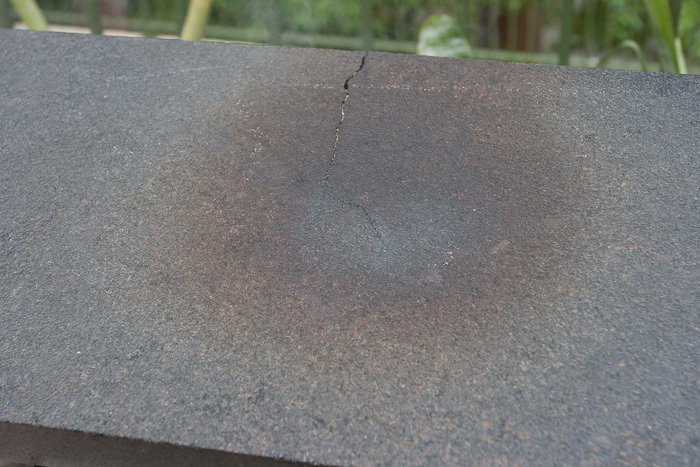 This stone was being heated by live embers beneath it. 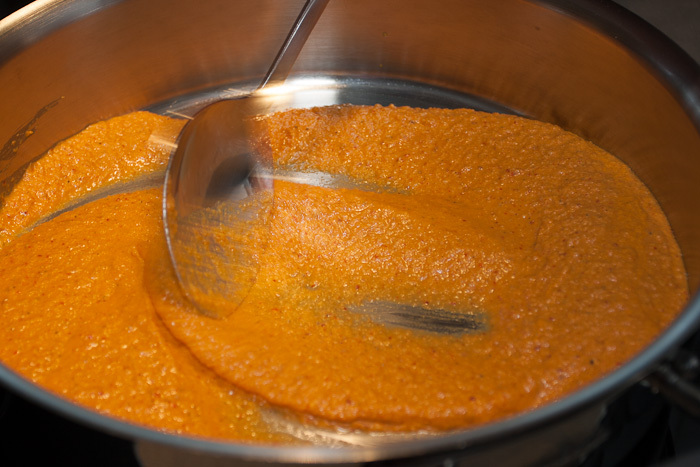 I couldn’t stop watching this dish being cooked and the end result was perfection! The desserts included nimish, seviyan ki kheer and much, much more. . . The bride and groom departed, the guests dawdled and lingered and I left a happy ‘guest of a guest’ as I learned the name of the dish. Well, let’s leave the wedding guests and the couple for now and fast forward to 2012. The city is Bangalore, the place a 5-star hotel. I am visiting India after a few years. Every time I come back to this once, appropriately, named ‘garden city’ I see more and more concrete structures in the form of 5-star hotels and high-rise apartments take over the beautiful gardens. These huge properties with mega lobbies and many bars/lounges house multi-cuisine international restaurants. However, ironically, the one thing missing is an ‘ethnic’ Indian restaurant – the kind that will showcase the local cuisine of the region. I mean, I do wonder why one would go to India and then avoid, okay, avoid the street stalls, but in the swish hotels, why not showcase our diverse cuisine? Anyway, let’s get back to the big hotel where I’m meeting my old friends. There are seven of us at the bar and we all belong to the hospitality industry. After a few drinks, when the music starts to sound like a ‘cacophonous’, we move to the open-air restaurant so we can hear one another talk. We’re older guys now, remember! Anyway, more wine and more snacks appear. The snacks are beautifully presented and perfectly cooked. We have a paneer dish, a chicken snack with pepper and fenugreek followed by a serving of prawns with a sweet and hot and sour dipping sauce, just beautiful. But where is the local food? How about some Mangalorean style snacks to go with my French red wine? I ask my friend, who is a senior teacher at the catering college, if the young generation of chefs graduating from the college are training in ‘ethnic’ cuisines and her smile says it all. Well, what can I say?! How very ridiculous and absolutely blockheaded this approach is!! No wonder this cuisine has remained where it is, right at the bottom of the pecking order in the world of cuisines, when in fact it should be right at the top as it contains more diversity and richness than any other cuisine the world can imagine! But unfortunately that is not how it is. Every region has its unique style of cooking not seen anywhere else on this planet. When most chefs in the world are trying to create dishes, we in India have food that has never been explored, all we have to do is recreate it and present it in a modern way, just look at Mr Vineet Bhatia. You don’t know this man? He says it how it is! 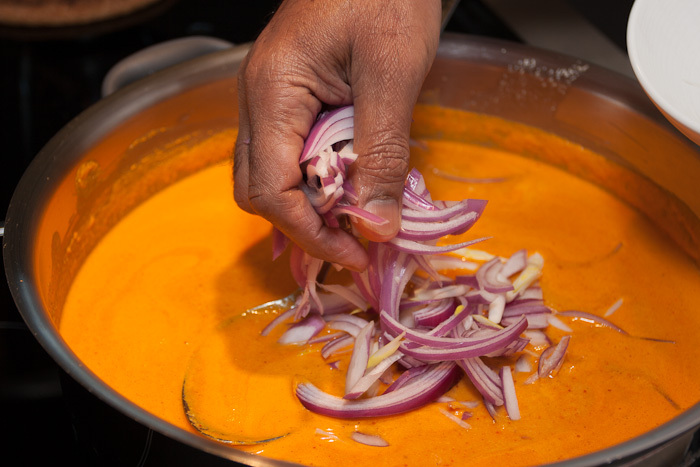 In my 30 years, or so, of cooking Indian food I have yet to come across an Indian chef who has a Michelin star cooking French, or Italian, or Mexican food (the list of other food nationalities is long but my space is short and I’m sure you get the idea!) 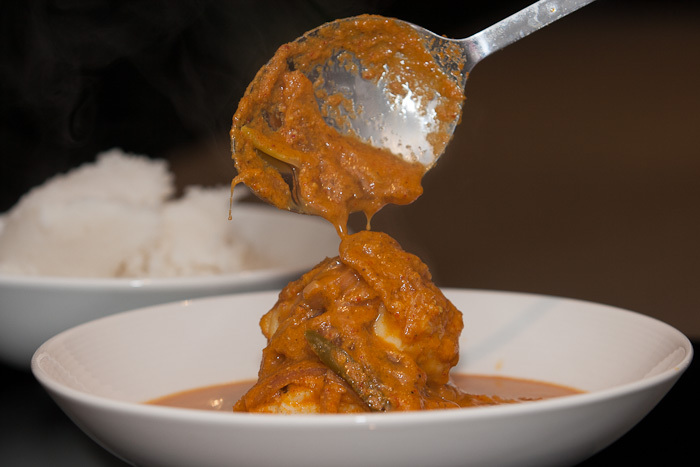 but I certainly have seen a fair few Indian chefs cooking their desi food who are at the very top of their game. All these chefs have at least one, and sometimes two, Michelin stars amongst them: AV Sriram from Quilon restaurant, Suvir Saran from Devi, KN Vinod from Indique restaurant, Atul Kochar from Benaras and Alfred Prasad from Tamarind restaurant, the youngest chef to get a Michelin star, to name a few!! It’s getting late in the day, but it could be worse if we desi cooks don’t wake up now and realise what a jewel of a cuisine we’re sitting on and letting go to waste as we’re not sharing its richness! Believe you me, there is plenty of room at the top, it’s not about replacing one cuisine with another but sitting alongside other cuisines. The world is waiting for us to make the first move!! Try and instigate change. Do it in small steps, with your family and friends. Even if you fail once, twice, or many times it is so important to educate. 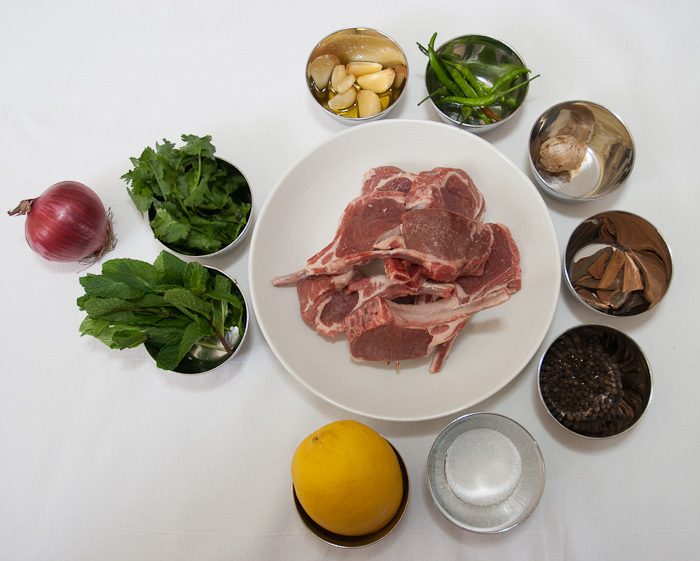 This is the complete recipe of paththar ka gosht from Shuruat. This is just the way we make it in my restaurant for our ‘Chef’s Tables’, and we are cooking on a paththar, of course!! 2. 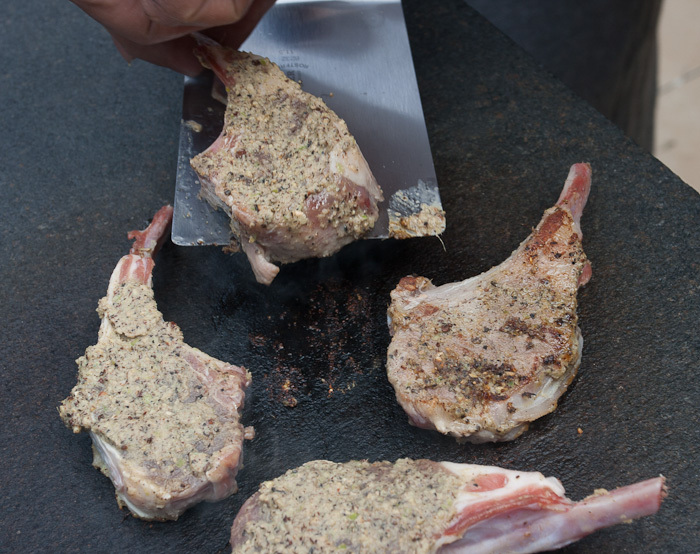 The stone must be seasoned before it is used as a BBQ plate. 3. Light the fire and place the stone on top of the fire. 4. 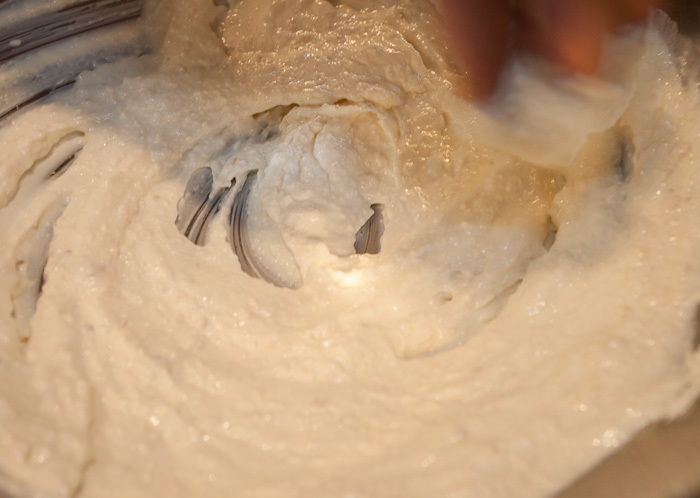 As the stone starts to heat up, increase the heat gradually. 5. 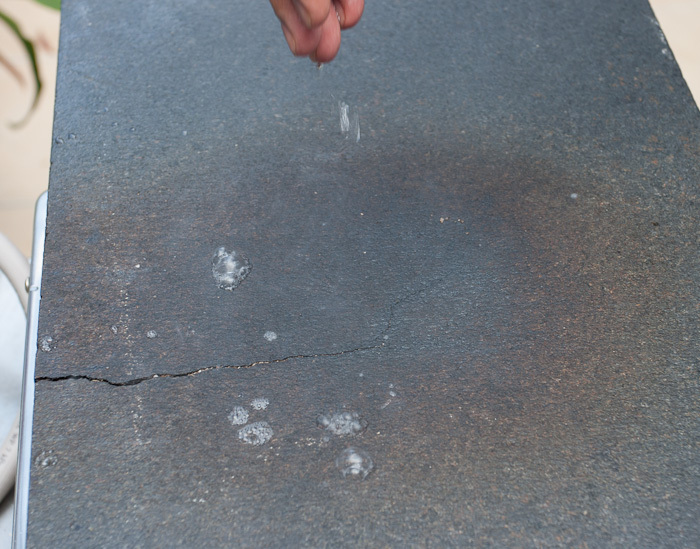 Once hot, put a drop of water on the edge of the stone. 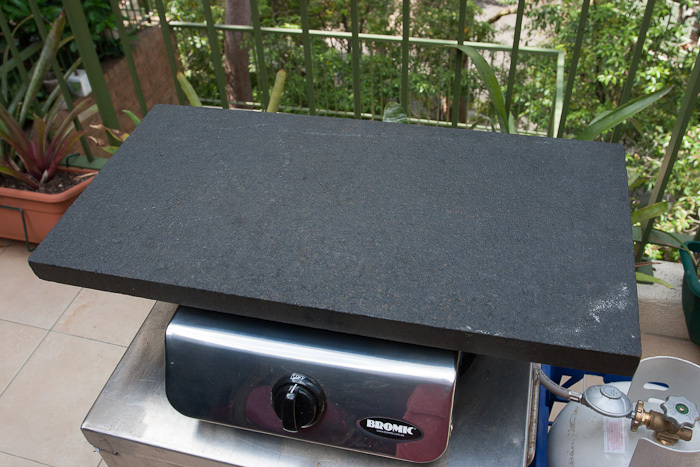 If the water sizzles, the stone is hot and ready to use. 6. 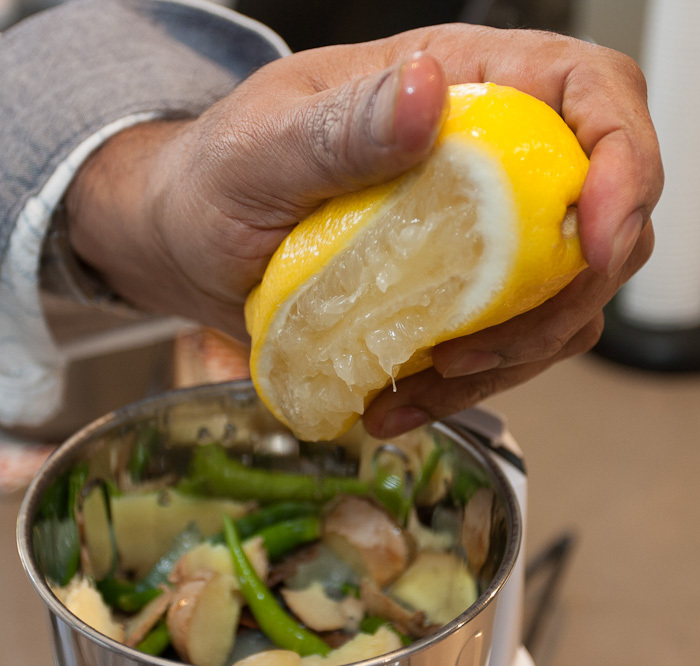 Lower the heat to moderate and maintain at that temperature. 1. 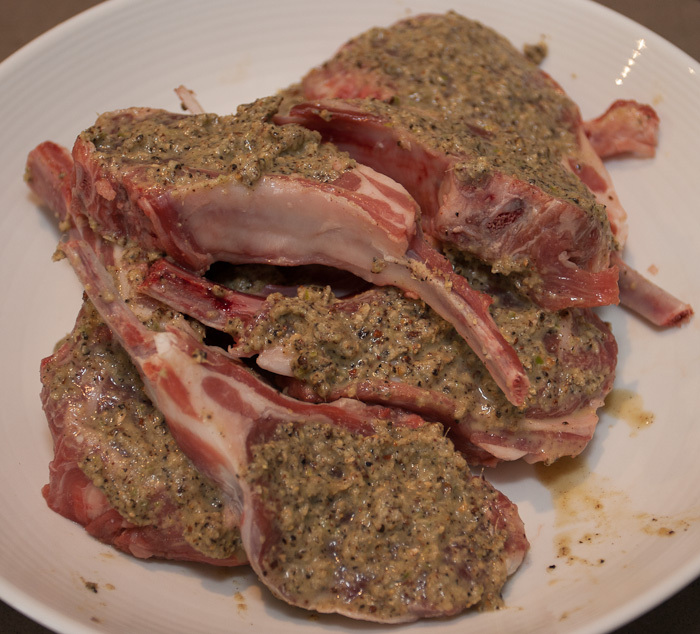 Following Step 2, set aside the lamb cutlets in a bowl. 2. 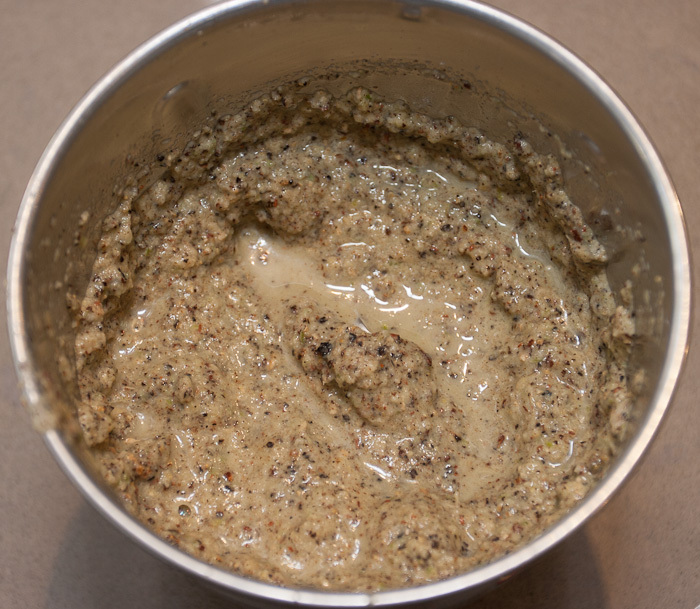 In an electric blender, grind all the remaining ingredients to a fine paste. 3. 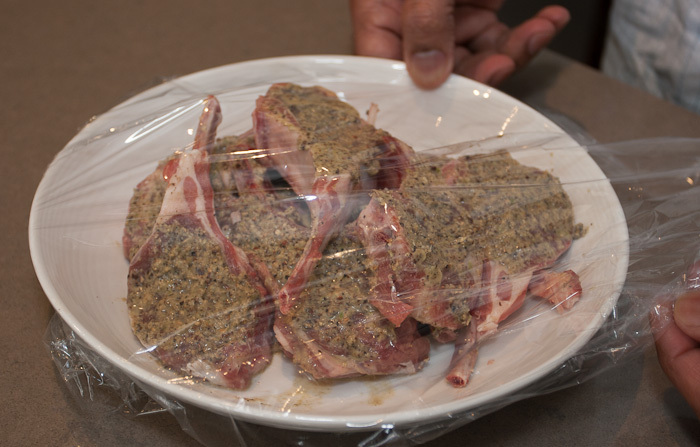 Apply the marinade on each cutlet, return to bowl and cover with cling wrap. Refrigerate for about 1 hour. 4. 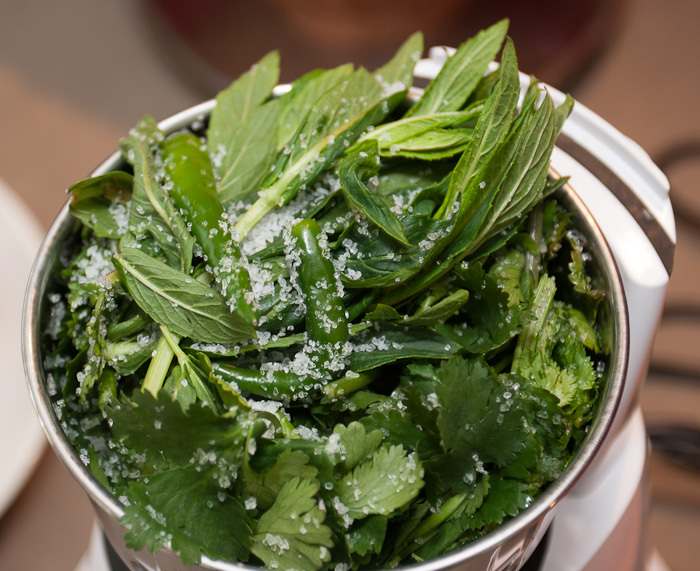 Following Step 3, in a clean blender mince the coriander and mint with the salt. Chop the red onion, then wash in cold water and drain. Set aside. 5. 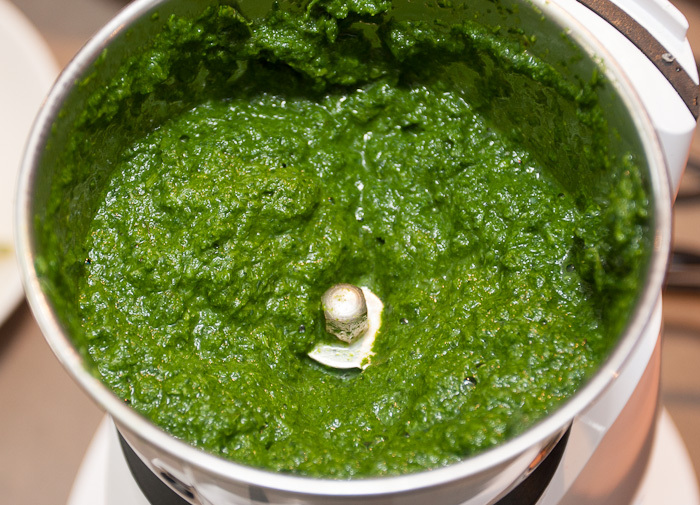 Mix the mint and coriander ‘pesto’ with the chopped onion and set aside to serve as an accompaniment. 6. 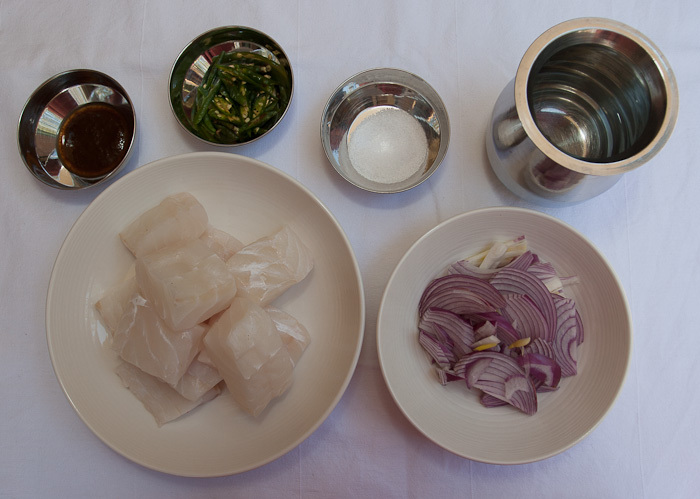 Remove the marinated cutlets from the fridge and gradually place them on the seasoned, hot paththar (stone). 7. 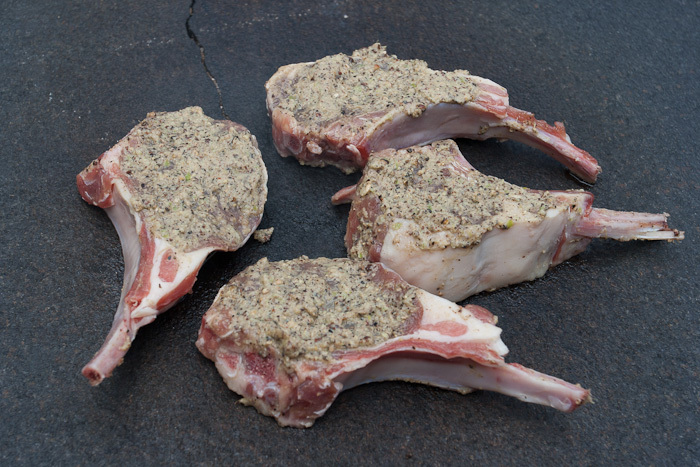 Cook the cutlets on each side till the marinade is crisp and the chops are medium-well cooked. 8. 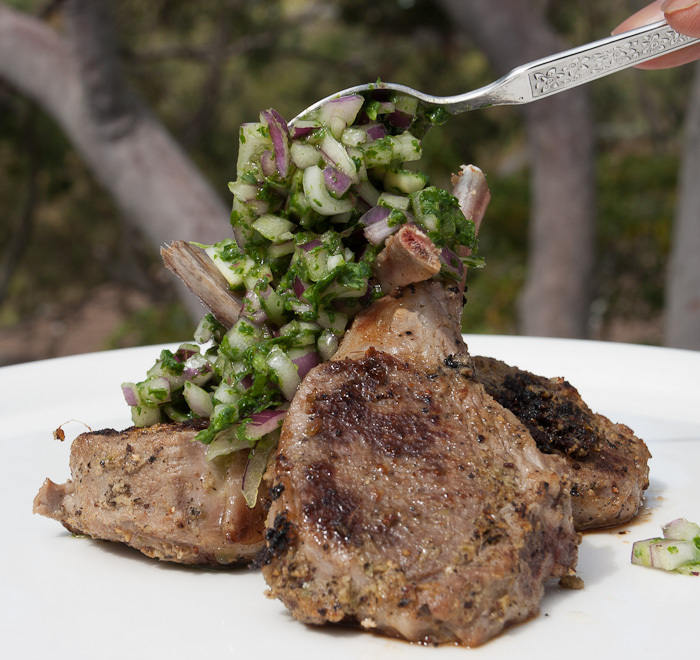 Serve with the onion and ‘pesto’ salad. So, there you have it, folks. 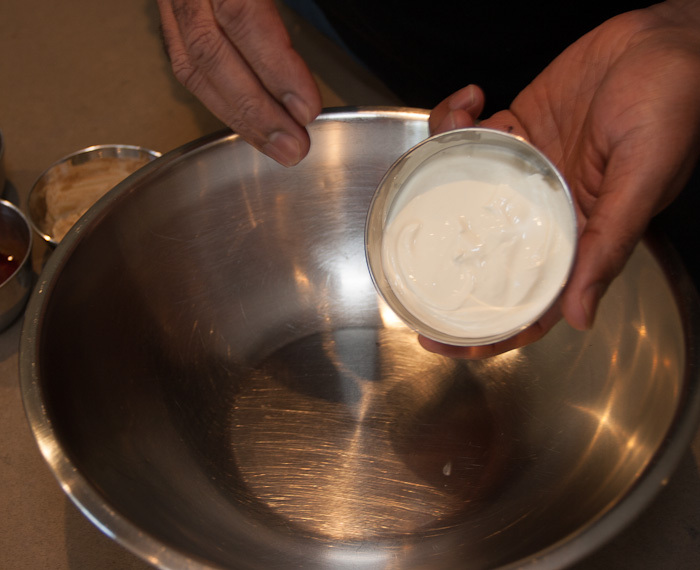 This is the simplest and best way to make this dish and then you can serve it in a ‘contemporary manner’. 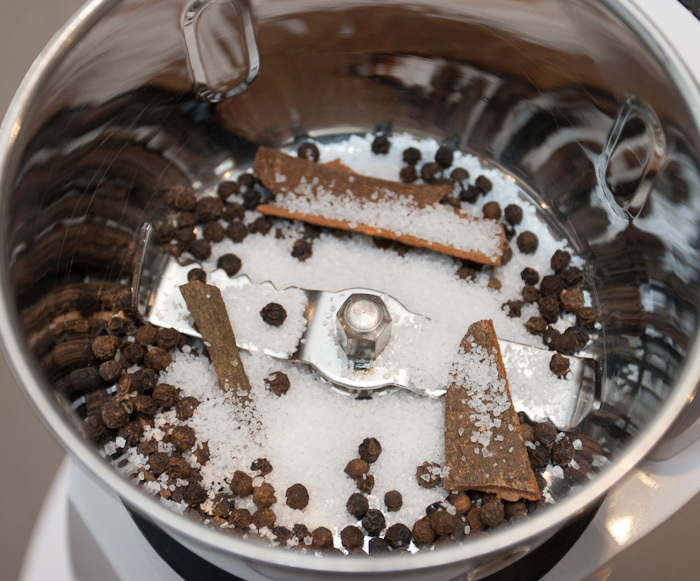 No, this is not a ‘contemporary’ recipe but it is an ancient recipe shrouded in a lot of history and then served in a ‘present-day’ style. A fusion, if you will, of ancient and modern. As for ‘contemporary’ food, well, let’s leave it to those who don’t . . . well, you know!! 1. 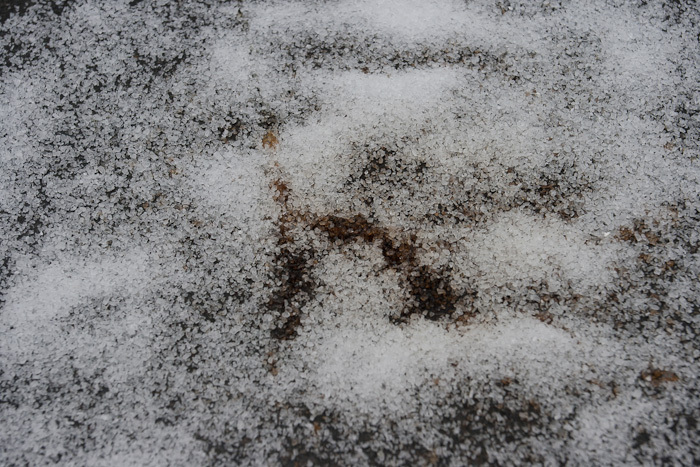 Season the stone by heating it gradually sprinkled with salt. As the stone gets hot, gradually increase the heat. 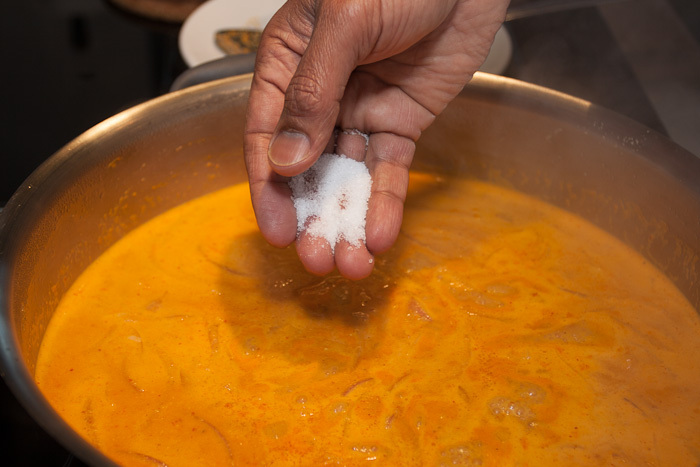 The salt starts to cook and ‘cleans’ the stone. 2. 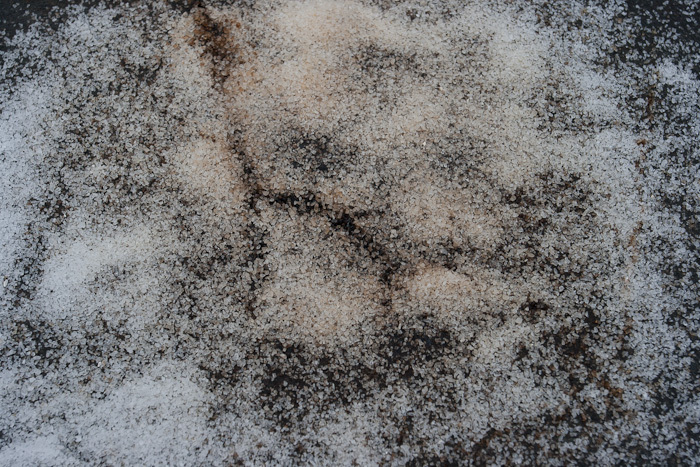 When the salt turns black, reduce the heat, remove the blackened salt, wipe the stone and allow to cool. The stone is now ready to be used as a BBQ plate. 3. 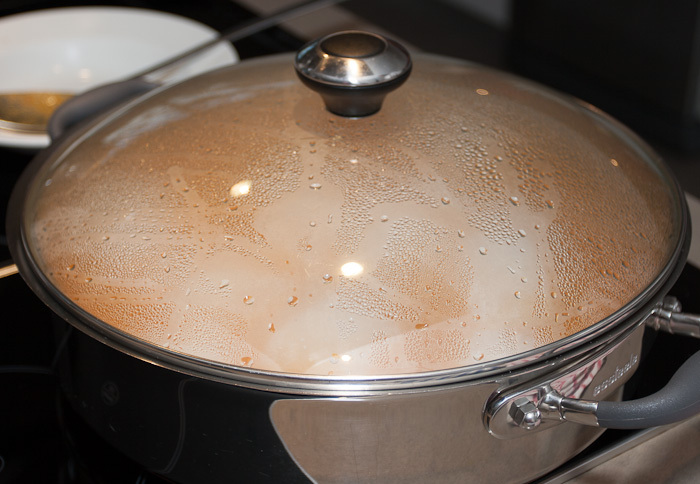 If the stone cracks during the seasoning, it could be because it is not heavy enough for its size and it may have an air pocket. 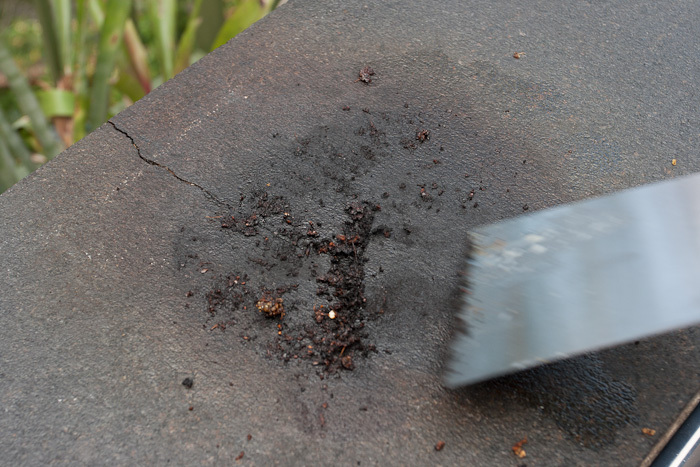 A cracked stone can still be used as long as it is not washed. 4. 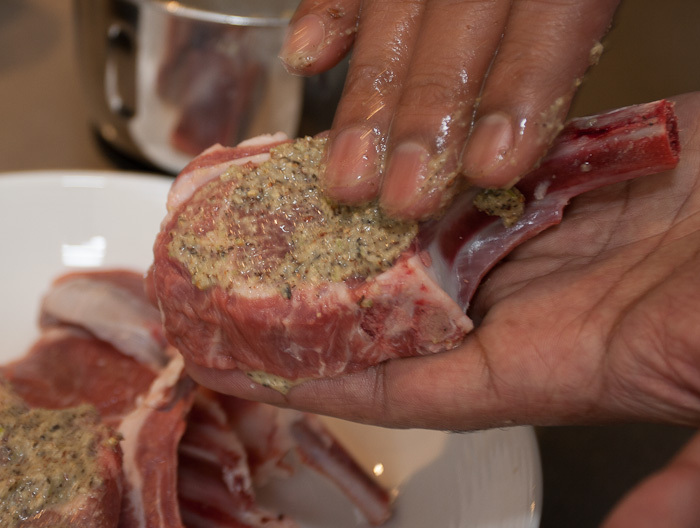 The stone does not need any oil as it renders the fat from the meat as it cooks and thereby keeps the meat moist and tender. 5. 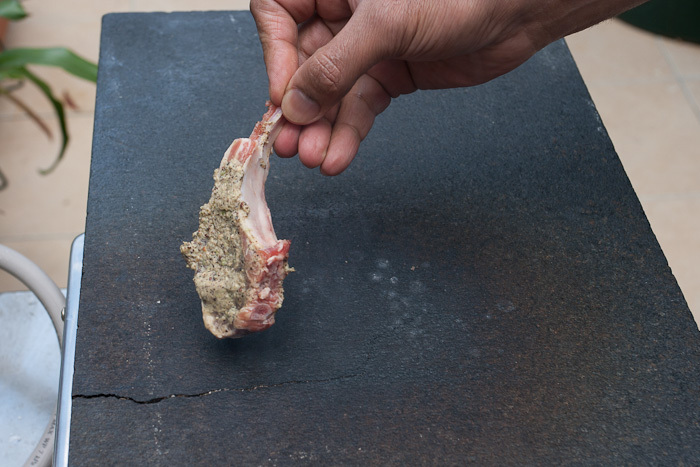 Any meat cooked like this on stone is ready to serve as soon as it’s ready, i.e. it needs no ‘resting’ as is the case when you grill on ‘metal’ plates. 6. 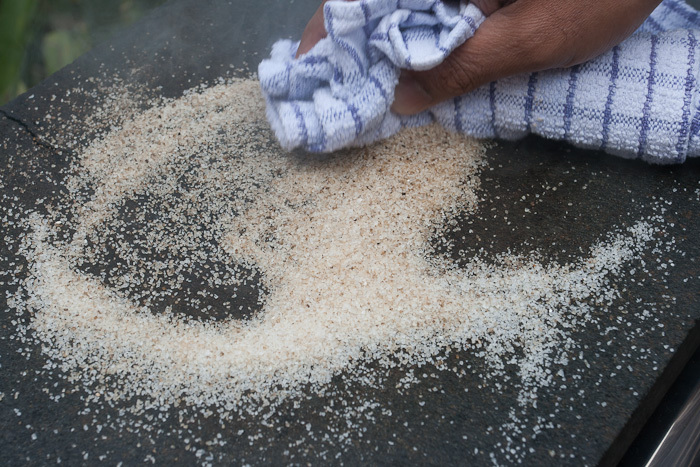 Never use any detergent to clean the stone as it is porous and will absorb the detergent. 7. 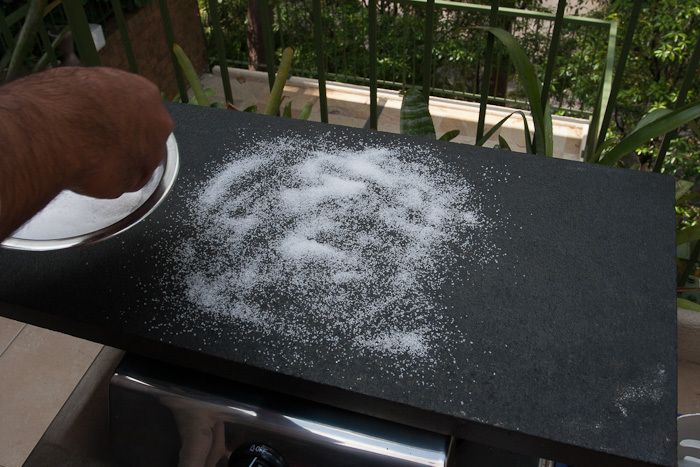 Cooking on stone is fun and kids just love it, ask my son. He wants all his meat dishes ‘stone cooked’. It’s so easy, all you need is a stone for each protein!!! 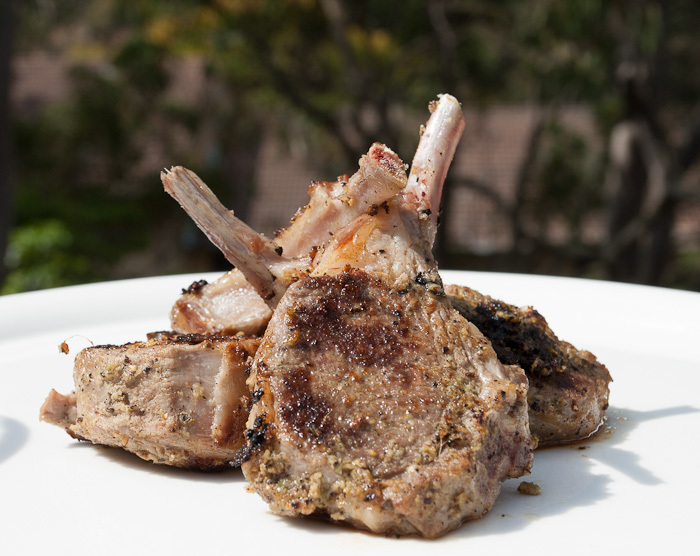 Posted in Classic meals, lamb, Uncategorized and tagged barbecued lamb cutlets, bbq cutlets, black, cassia bark, cassia buds, coriander, coriander and mint pesto, coriander pesto, fresh coriander, fresh green chillies, fresh mint, fresh mint pesto, garlic, grilled lamb cutlets, hot stone, Indian pesto, lamb cutlets, lemon juice, mint, paththar ka gosht, peppercorns, persto, red onion, salt, spanish onion. Bookmark the permalink. The king of kebabs . 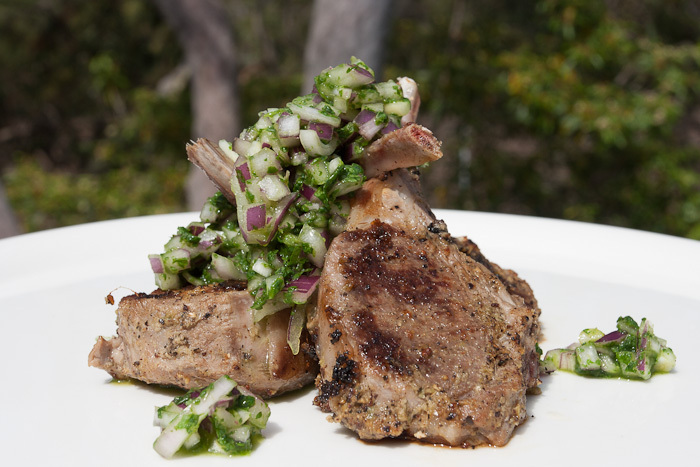 . . perfect for a father’s day lunch or dinner!! Well, the year was 1969, and the place was Hyderabad. 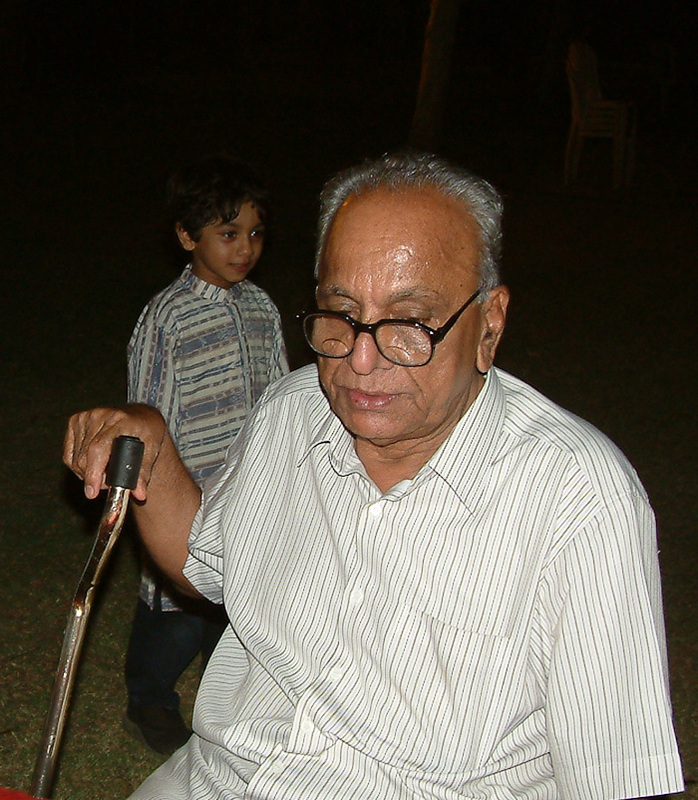 I had spent a full day with my dad [I called him ‘Papa’], watching a game of test match cricket in Hyderabad. It was India versus New Zealand. Day 1. And what an amazing and unforgettable day it was!! We watched Papa’s favourite players in action. We saw Nawab Mansur Ali Khan of Pataudi Jnr, the youngest player ever to captain a national team in the world, take on the Kiwis who were led by the well-respected Graham Dowling. The Indian team also had Ajit Wadekar, Bishen Bedi, Venkataraghavan and Prassanna. On the Kiwi side there was Turner, Bevan Congdon, Dayle Hadlee and . . . well, the list goes on! It was also my first experience of watching a test match ‘live’, as it were. It wasn’t on the television but in the stadium, the Lal Bahadur Shastri Stadium we called it “Fateh Maidan”. Mum had packed lunch for us, and it included aloo paratha with home-made mango pickle served in two boxes: one for me and one for my dad. We reached the stadium at around 8 a.m. just as it was being announced on the radio that all roads leading to the stadium would be closed after 9 a.m. which meant that if we’d been late my dad would have had to park his Lambretta scooter a long way from the stadium. But we arrived well in time, we weren’t going to be late for this game, no way!! Anyway, the day finished with NZ making a smallish total, I don’t remember the exact score but the Indian spinners did what was expected of them. It was a great day’s play. But there was more to come. On our way home, Papa took me to a small restaurant called a dhaba which I was told later was the name for a roadside eatery. 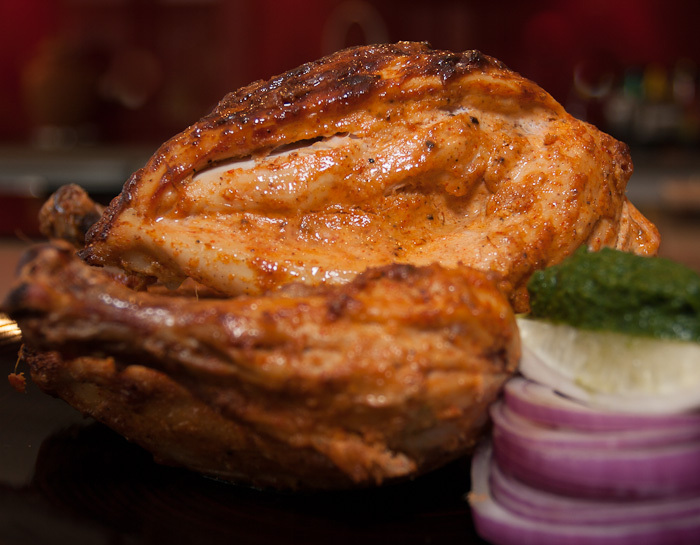 At this eatery we ordered two “full tandoori chickens” as a ‘parcel’ which is a term used to this day in India for a ‘take home’, ‘take-away’, or whatever you want to call it! All this wonderful smelling food for just the four of us, sorry, the three of us as my mom’s a vegetarian. Papa bought mirchi pakoda (batter fried stuffed banana chillies) for my mum. I smiled at the recollection as I remembered my sensory system was about to explode with the wonderful smell the parcel was giving!! Well, we reached home after what seemed like forever to get to. So friends, for a perfect father’s day, I suggest you watch the cricket, have a gin and tonic (with extra ice and an extra splash of lime juice) and have, well, I’m sorry about this part as you’re going to have to make your own king of kebabs: tandoori chicken!! So, to help you do this, here is my version of the king of kebabs, and yes, you certainly can make it at home even if you do not have a tandoor, just don’t call it ‘tandoori chicken’. You can, however, certainly call it the king of kebabs!! So, without further ado, it’s now time to cook the KING OF KEBABS for the King of the house! Posted in chicken, Restaurant photography, Uncategorized and tagged baked chicken, chicken, chicken kebabs, coriander, garam masala, garlic, ginger, green chillies, ground, Kashmiri chillies, kashmiri chillies whole, lemon, mint, mint and coriander chatni, mint and coriander chutney, pomegranate extract, red onion, salt, small green chillies, spanish onion, tandoori chicken, tandoori masala, vinegar, yoghurt. Bookmark the permalink. © Ajoy Joshi, 2012. 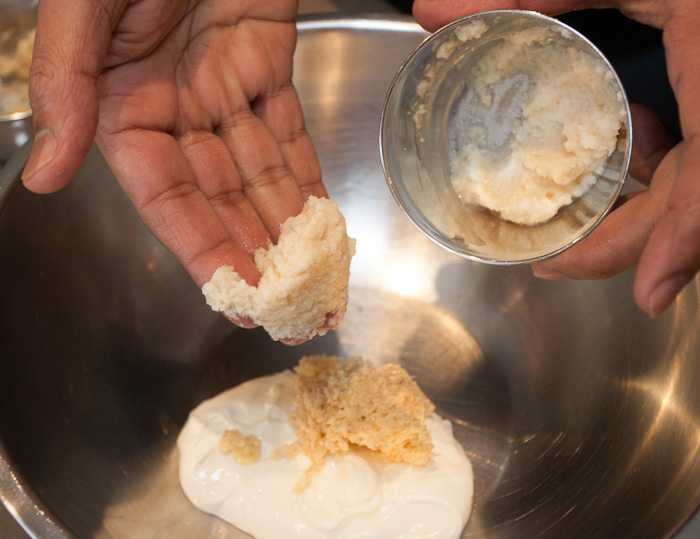 Unauthorised use and/or duplication of this blog including recipes and images without express written permission from Ajoy Joshi is strictly prohibited. Excerpts and links may be used, provided that full and clear credit is given to Ajoy Joshi and thoughtsfromajoy.com with appropriate and specific direction to the original content.